Is there anything else to add? 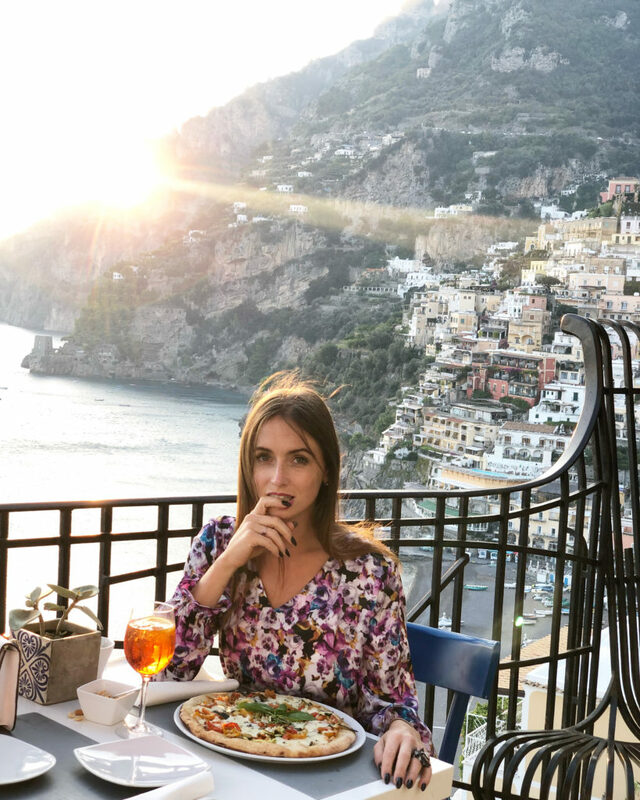 No wonder the couples who plan their wedding and are travel-aware consider organizing their big day in this beautiful Italian corner. 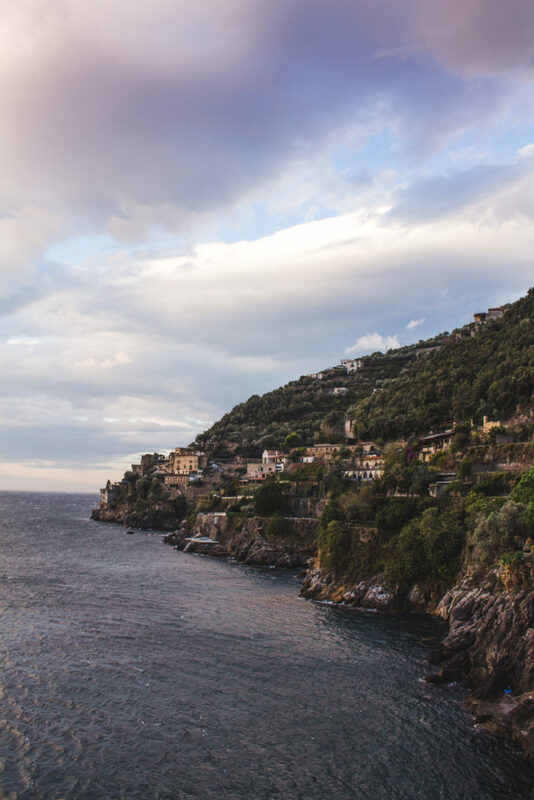 Travelling to this part of Italy for a wedding would mean exploring more than one bucket list place. 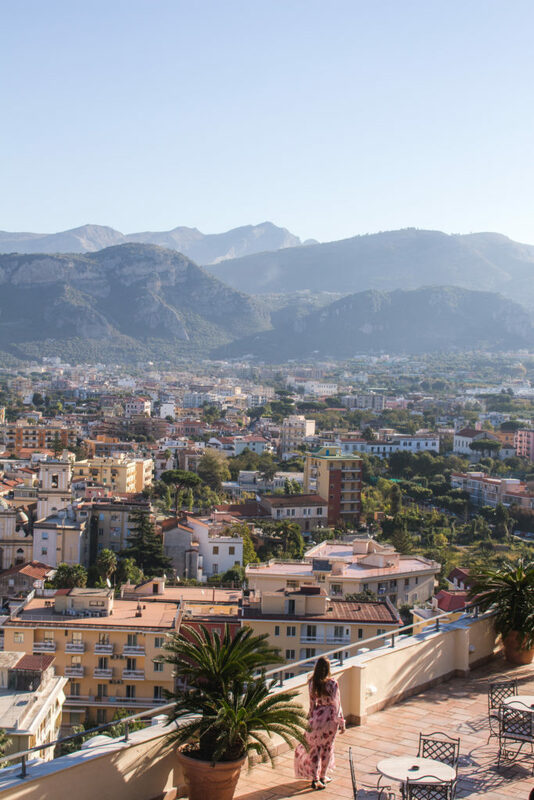 You could land in Napoli and then drive from Pompei, Sorrento, Amalfi and all over to Salerno. 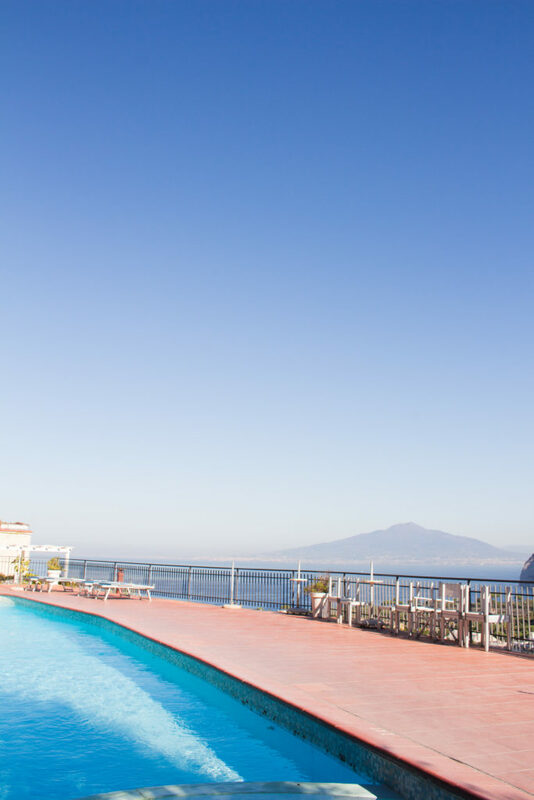 You could see also stop by Mt Vesuvio or stay in Napoli and see what the city of Pizza has to offer. Getting to this part of the world has never been so ‘easy’. The closes airport is located in Napoli, but the couple could also land in Rome or Bari. ….first. As always in my articles. 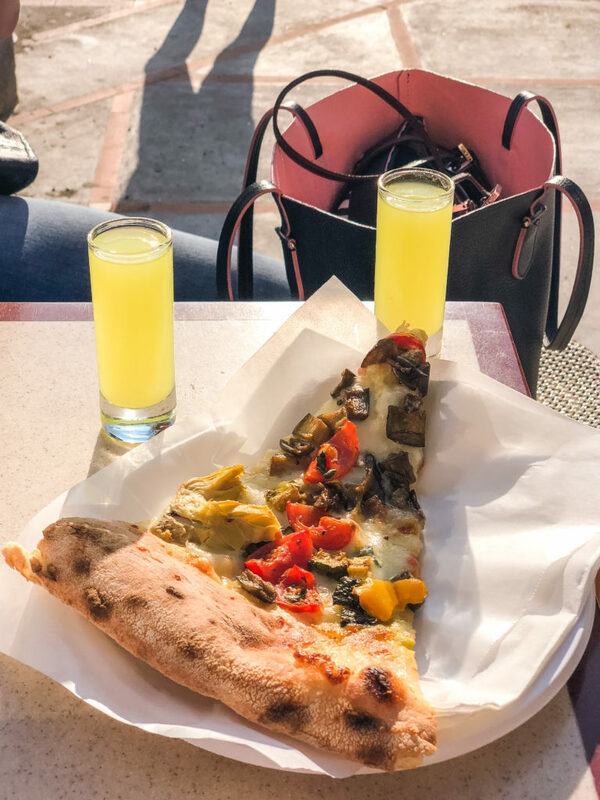 So is it legal for the foreign couple to get married in the land of pizza? Yes, it is. 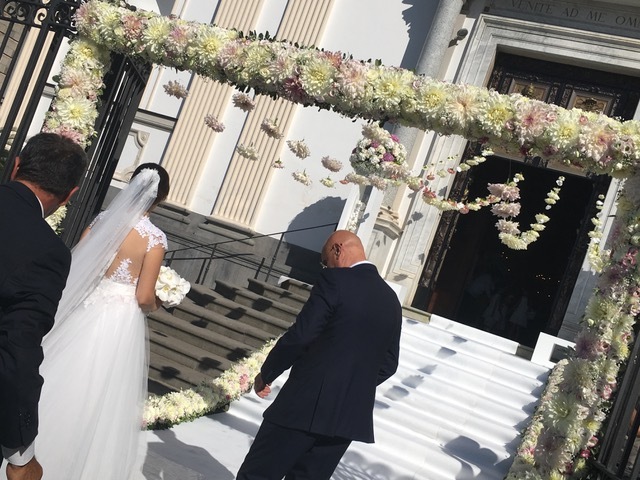 The couple, however, will need to obtain a ‘NULLA OSTA’, which is a Notice of Marriage (NOM) to be able to perform a legally valid wedding in Italy. 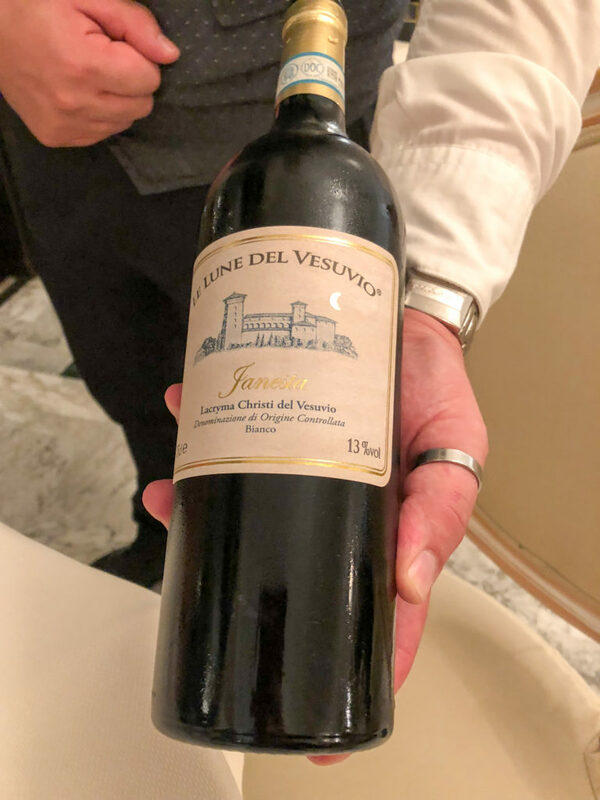 Moreover, the Italian authorities require proof that foreigners intending to marry in Italy are not already married – as it is in the vast majority of countries I wrote about. Once the Embassy receives the original copy of the Certificate of No Impediment it can issue a ‘Nulla Osta’. Different countries require different procedures to release this ‘Nulla Osta’ to let you get married in Italy. Some countries could receive such document by e-mail. In the majority of cases, however, the couple needs to apply for such document in Rome. The couple can also have a Catholic Wedding in Italia and they are legally binding! Religious paperwork needs to be received by the Italian Curia at least 2 months prior to the wedding. If one party have previously been married and the previous marriage has not been officially cancelled, the Catholic marriage will not be possible. I would advise contacting the embassy of your country in order to find out which documents and procedures are required to get the’ Nulla Osta’ before you even start planning your wedding. 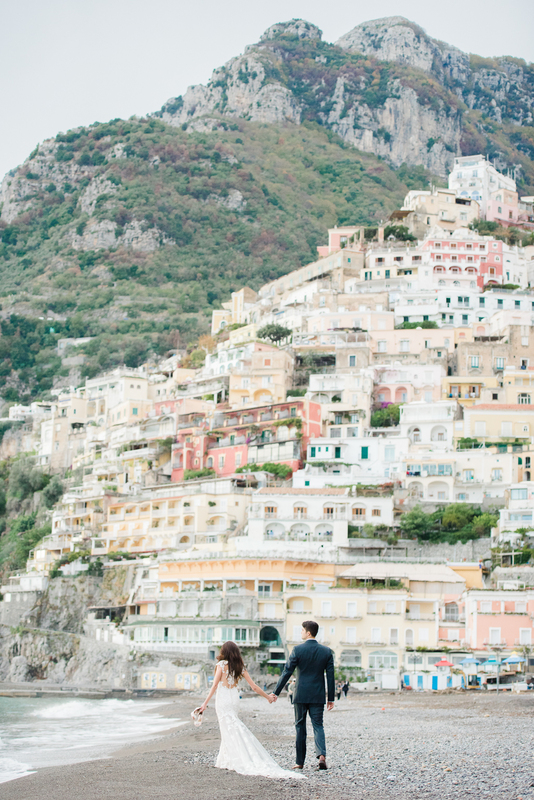 Positano remains the most wanted location for weddings on the Amalfi Coast. 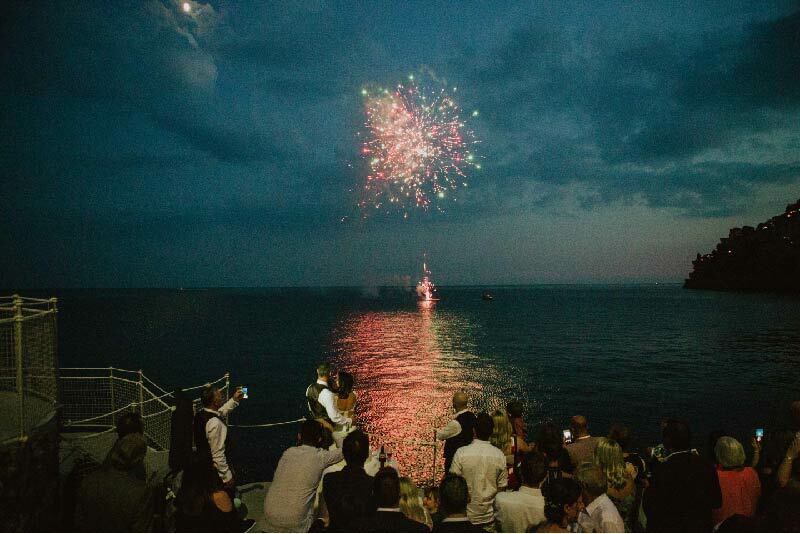 It is ideal for young couples looking for a romantic and joyful event. 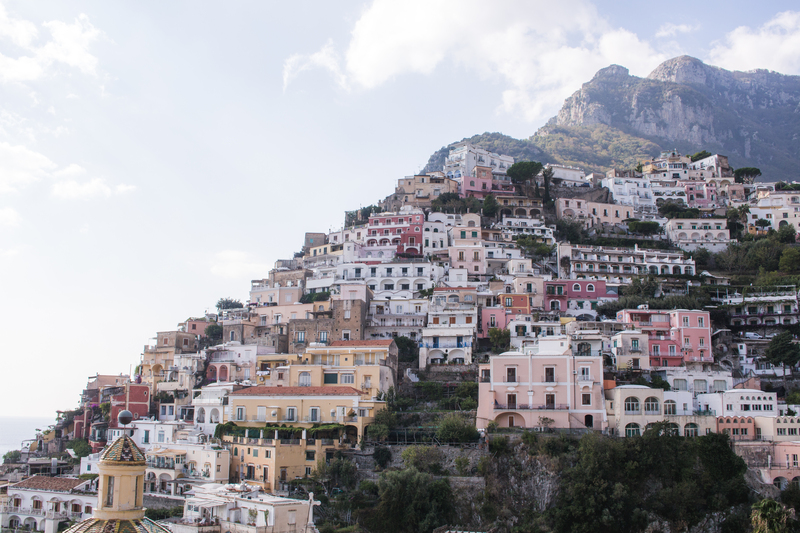 But let’s face it – Positano city is too crowded! It reminded me of all-packed Oia ( Santorini). It is hardly possible to achieve this ‘I do’ moment without thousand of eyes staring at you. For this reason, I decided to look for something intimate, away from the crowds, but still luxurious and well. 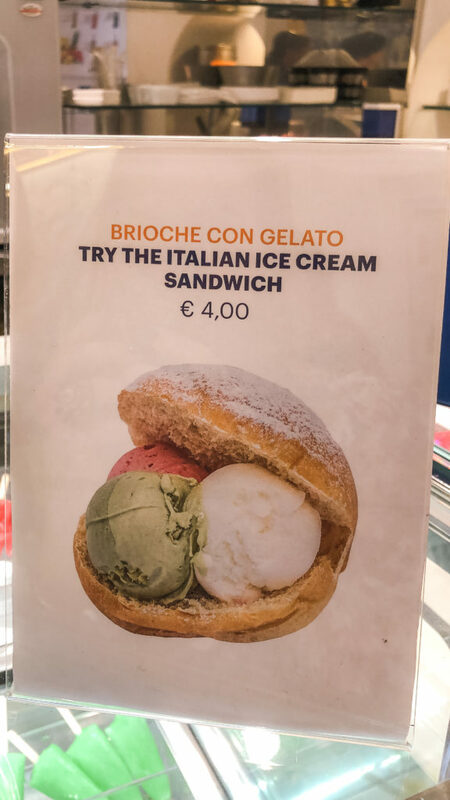 very Italian. 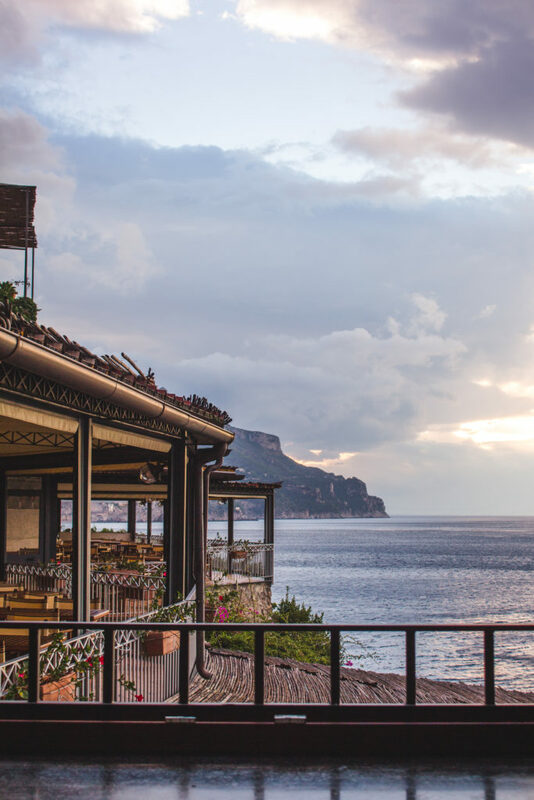 Il Ritrovo was the first Amalfi Coast place we’ve discovered. 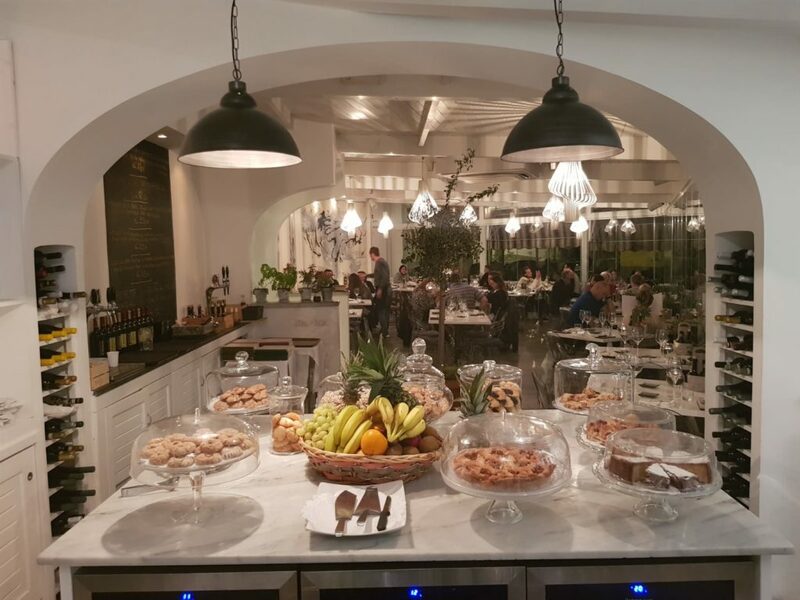 I am always after boutique and luxurious venues run by the family. This is exactly how Il Ritrovo could be described. 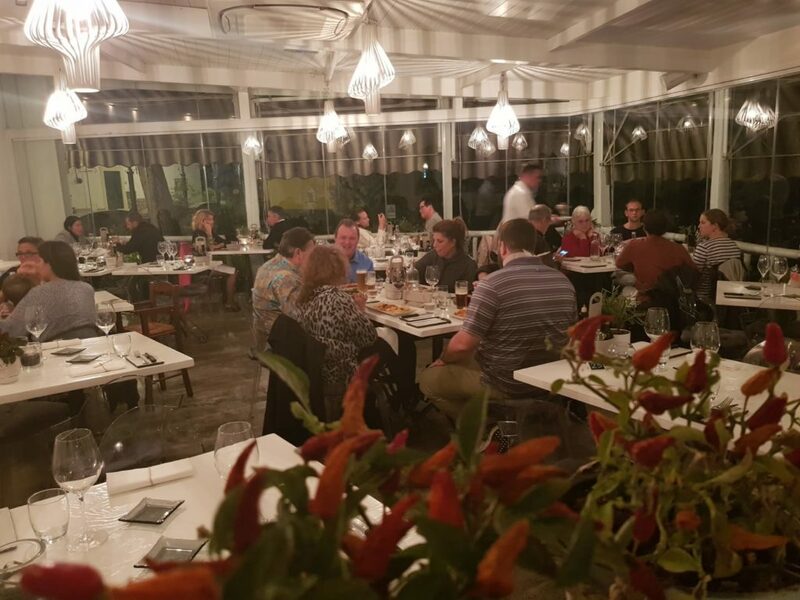 Having your wedding at Il Ritrovo would guarantee a real Italian experience like no other. 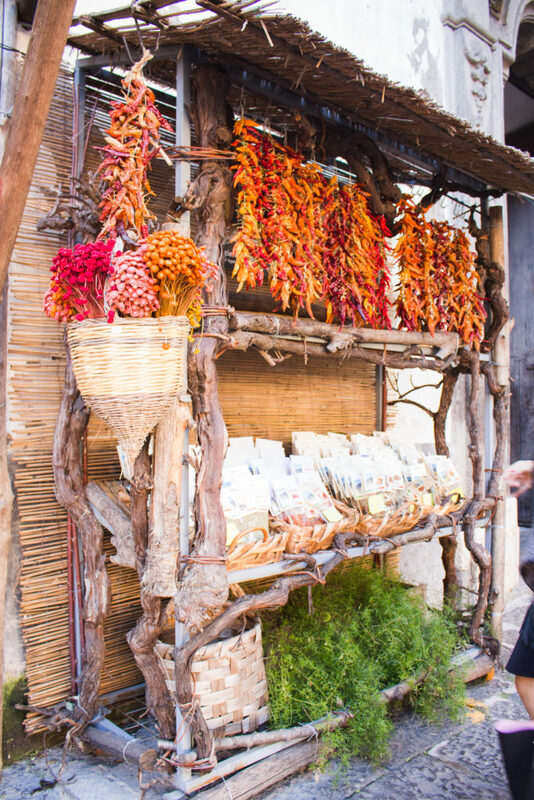 Away from the crowds of Positano, home-made food from the fresh (eco!) ingredients, house wine (delicious!) and what is the most important – family owners are the staff. The venue was re-opened not so long ago and is now taken care of by two brothers, who inherited the place from their parents. 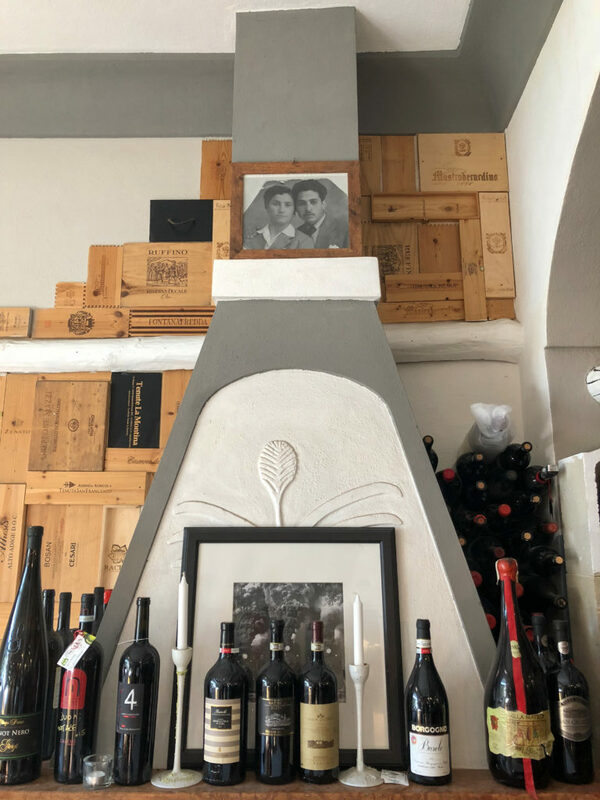 You can tell the atmosphere in the restaurant is very welcoming – the smell of the fresh Italian dishes, the sound of an Italian music, great house wine and the owners! 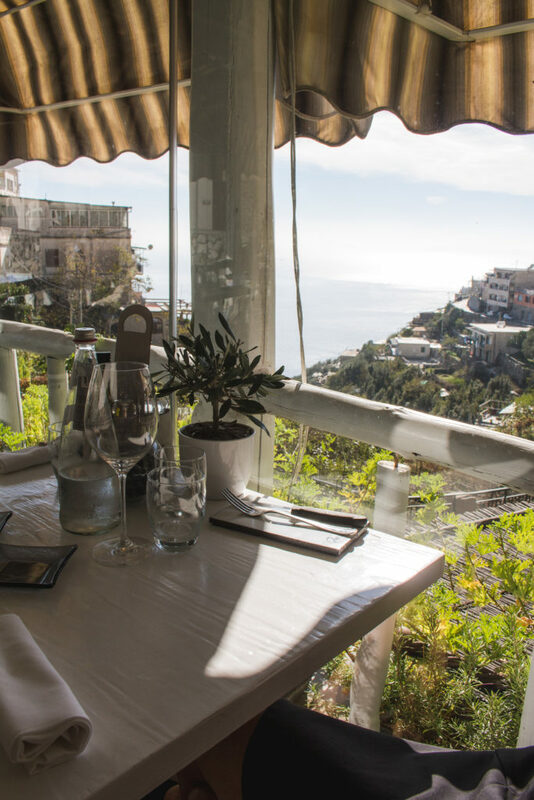 Il Ritrovo is located on the hill of Montepertuso – not in Positano city center. 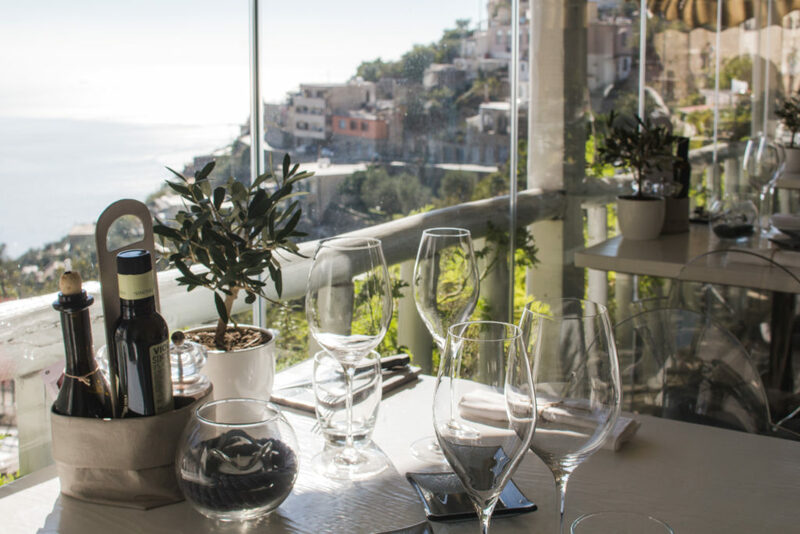 It takes around 20 minutes by car (from Positano city center) and there are a free shuttle bus and a complimentary taxi for the restaurant guests. 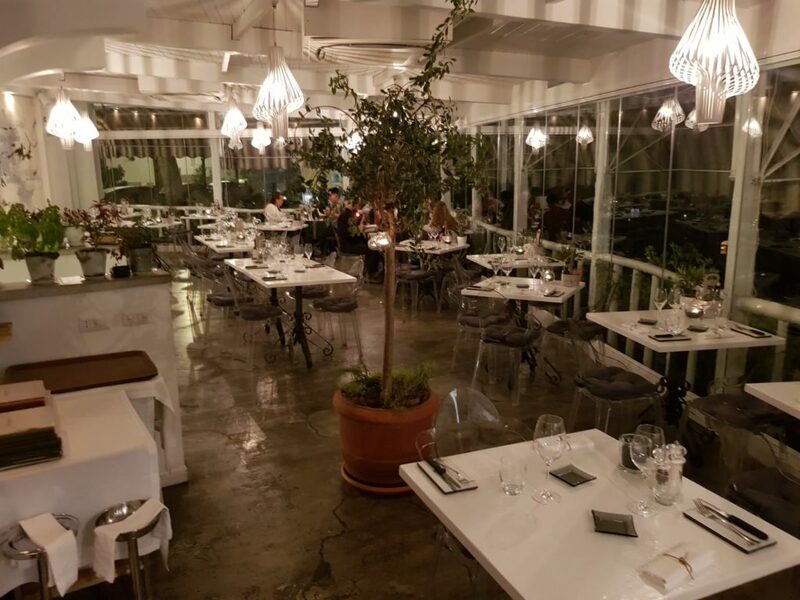 The restaurant is, in fact, a boutique venue, but I think it would be just perfect for a small ceremony up to 30 guests. There is an outside area, which could serve as a dance floor or a sitting area for 18 people. The view from the main terrace is astonishing -, especially in a great weather. 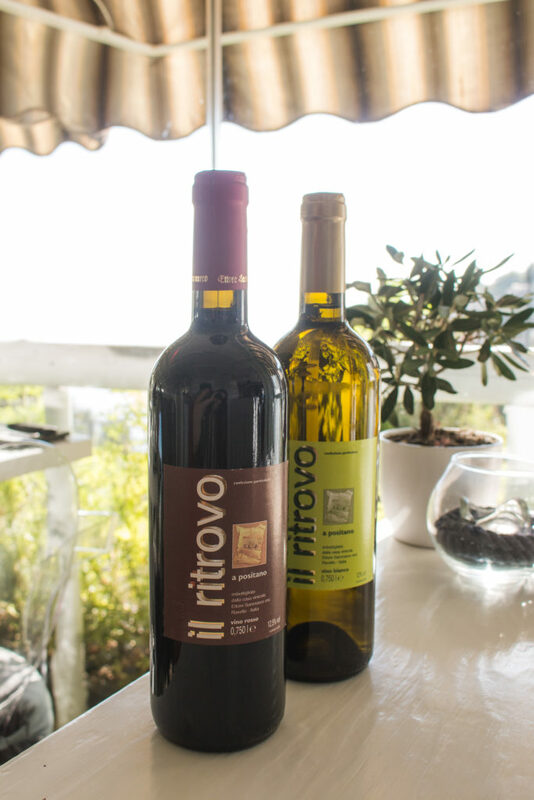 Il Ritrovo is perfect all year round except the period from the 6th of January until late February. Christmas and New Year’s wedding are possible – just ask for a quote and book a couple of months in advance. We were told the best time would be the Spring and September/October – because of the temperature. 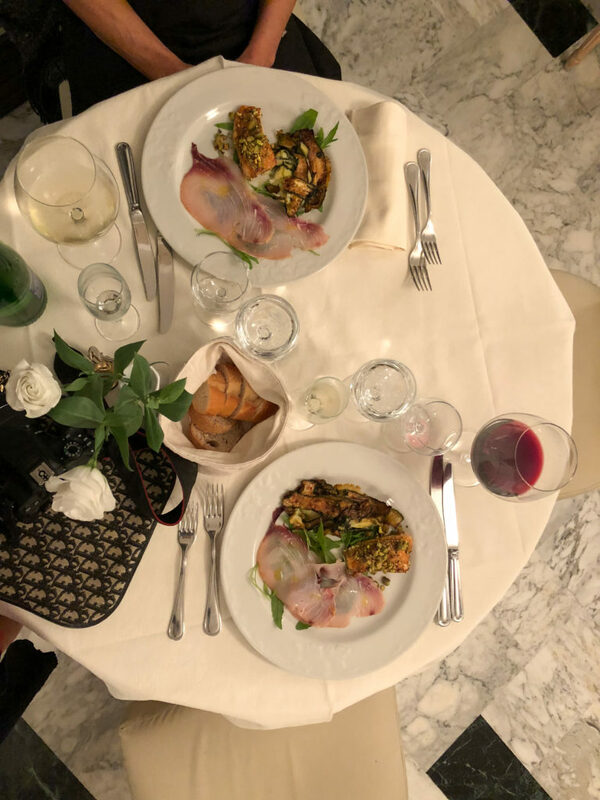 I have never been really keen on photographing food as I don’t feel like a food blogger, but the culinary experience at Il Ritrovo was exceptional! Allow me to share this experience with you! The meat is always fresh and delivered from Tuscany. The pasta is home made by the chef Barbara, who is one of the owners. 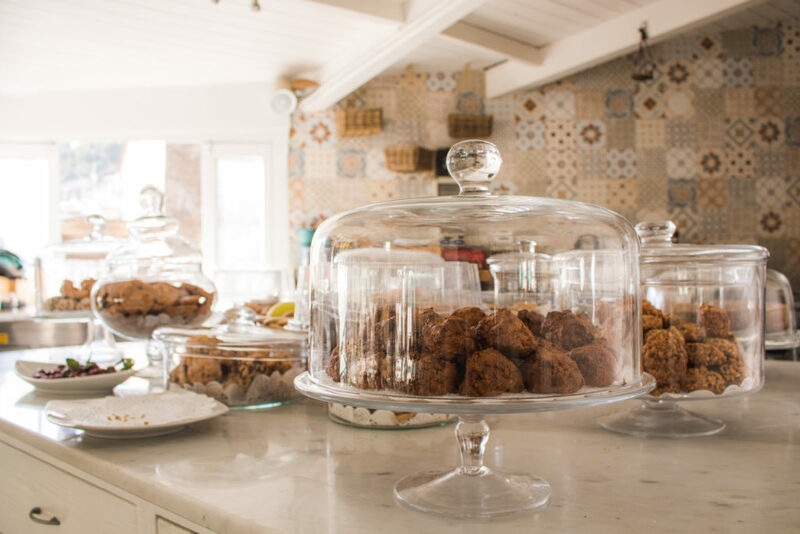 The veggies come from the family’s garden and are delivered fresh every morning, which makes the dishes really mouthwatering! 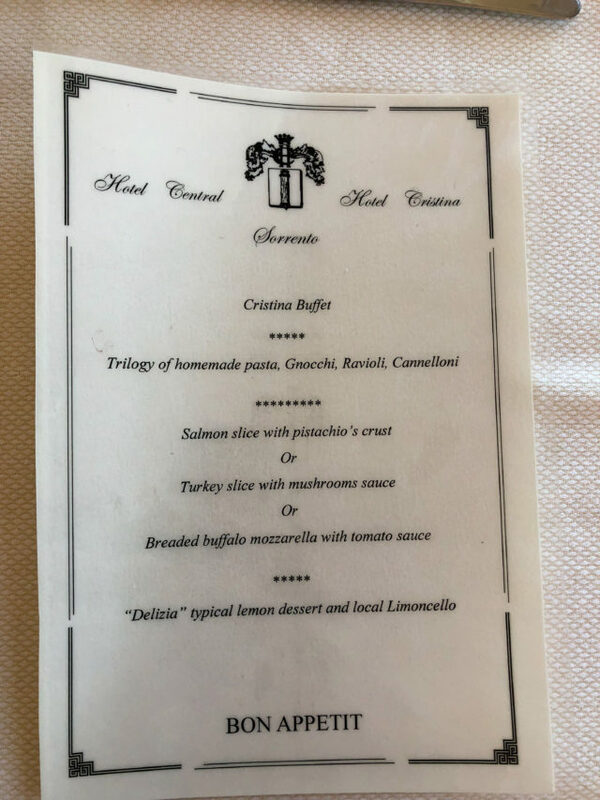 As for the prices of a wedding at Il Ritrovo, there are no packages. 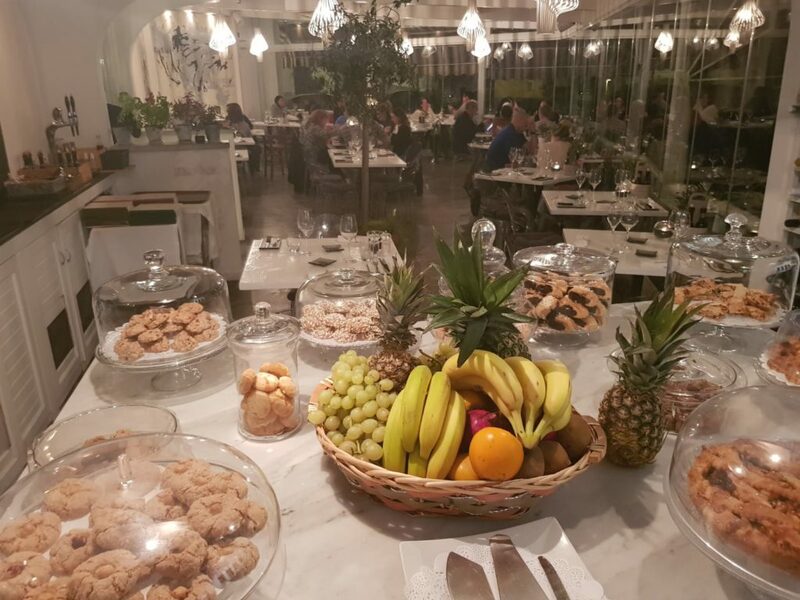 The owners mention some food deals for the guests, but there are no price offers in terms of packages. The wedding menu could be as fancy or as modes as you want, but it might start from around 70 euro per person. 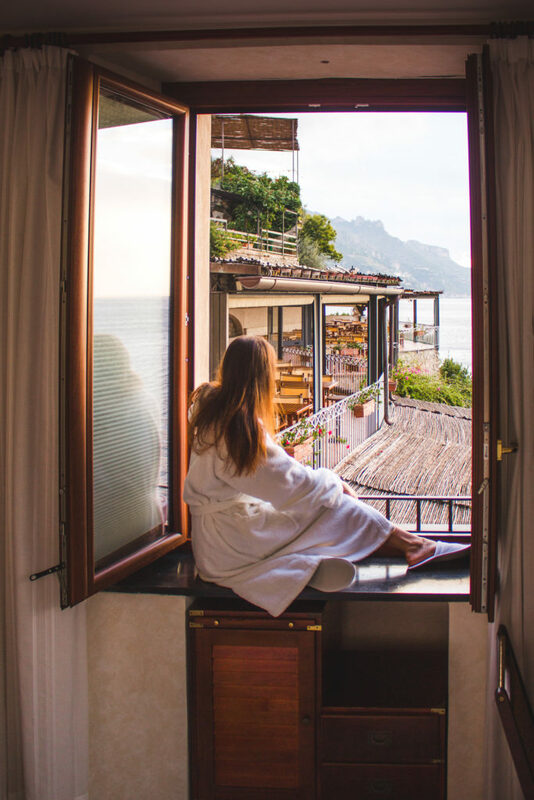 Hotel Marmorata is a 4-star luxury resort places set in a fifteenth-century paper mill, located in the charming inlet of Ravello Mare. 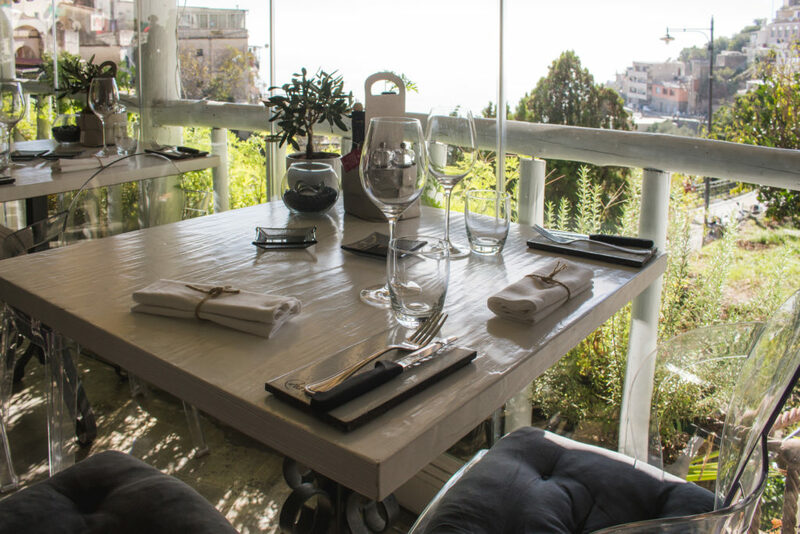 The main and the most important feature of the hotel is that it offers privacy and some of the most astonishing sea and cliffs views. We have fallen in love the moment we opened the window. It was dark, after 11 PM, but the full moon was perfectly reflected on the water, which caused a W0W factor in both of us. 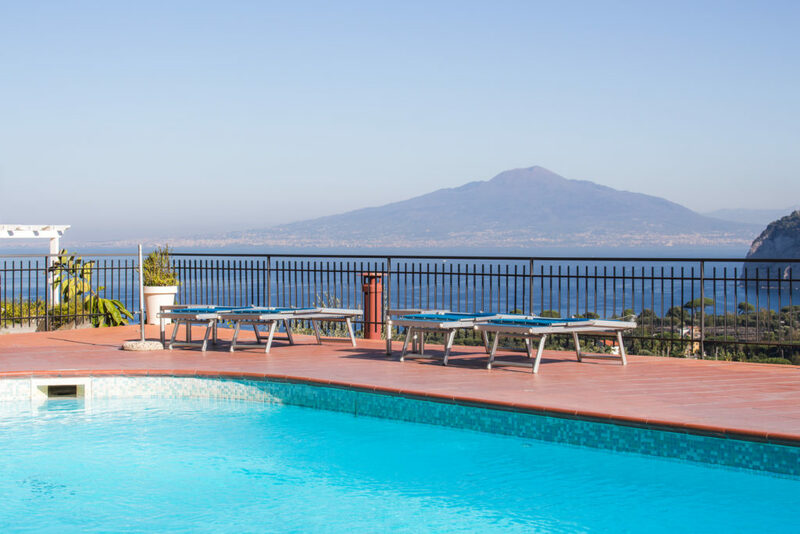 Despite the fact Hotel Marmorata is located on the main road from Salerno to Sorrento (the one and only road), the privacy is a domain of the place. You can actually breath in and out, away from the city. It is the feeling I am always after. You can feel the great atmosphere of the place. It is not a typical chill-out place but a place with loads of traditions and very respectful of Italian heritage. It is very luxurious, and you can recognize it only by looking at the wooden furniture of ceramic tiles. What we really enjoyed was the restaurant. 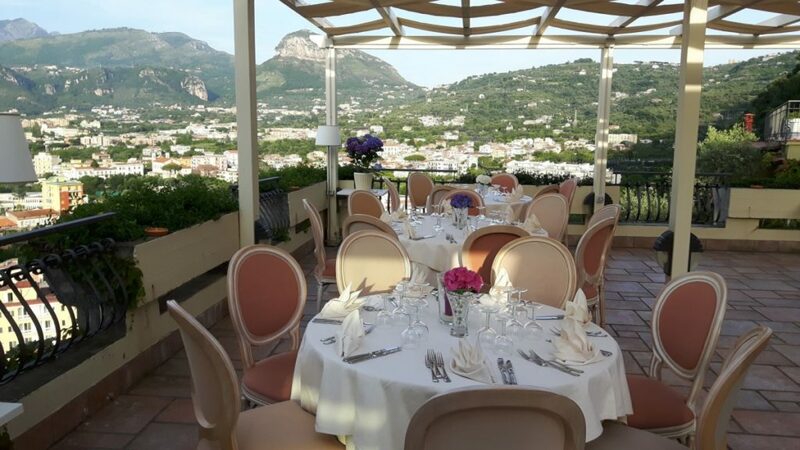 Having breakfast on a terrace was a great experience and would undoubtedly make a day after the wedding very special. 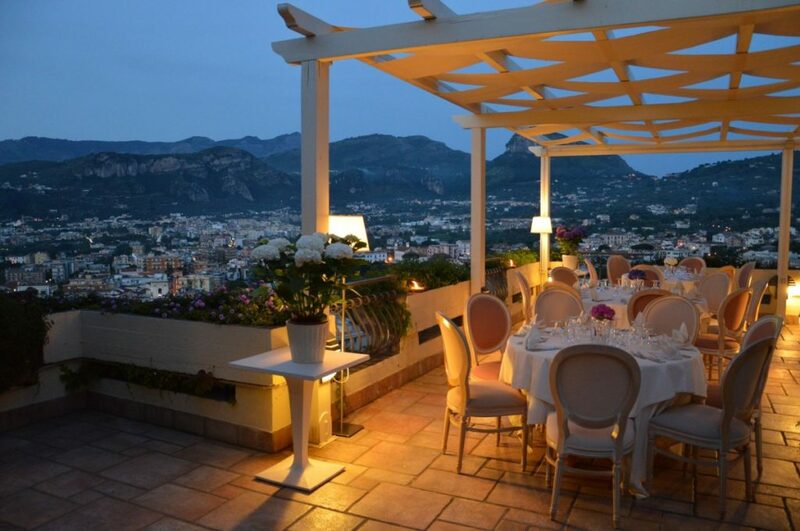 The hotel has a perfect infrastructure for both – a boutique and a huge wedding of even 200 guests. 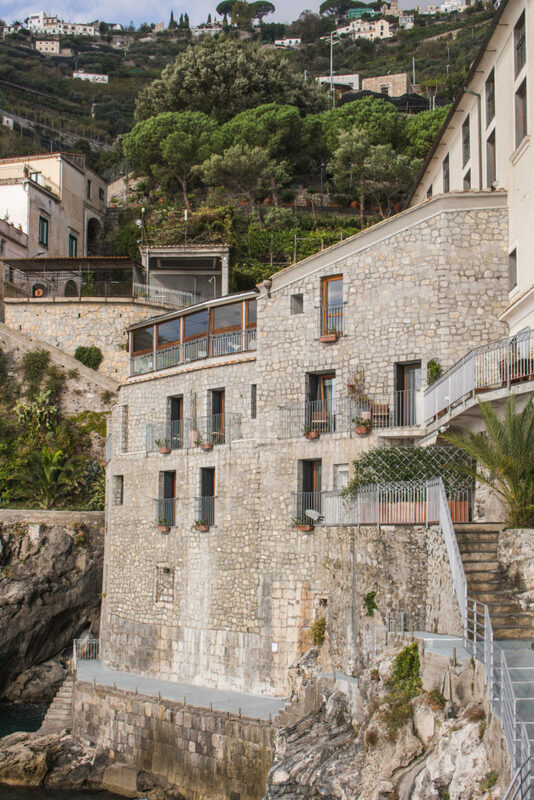 In fact, I found out one of my friend’s parent had their wedding held at Hotel Marmorata back in the days. It really has a great charm about it and would please even the most demanding couple! 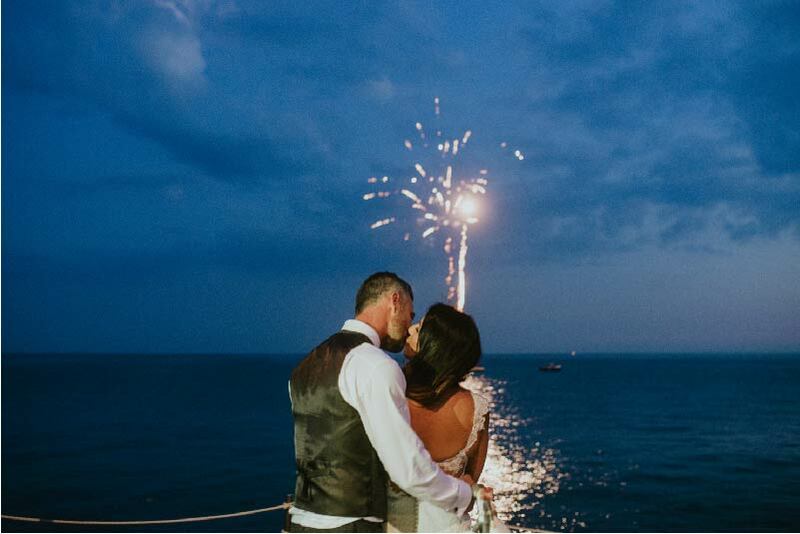 Hotel Marmorata Wedding does offer some wedding packages, but the total cost of the ceremony depends on the couple’s needs. It is often a matter of how they want to serve their dinner, how long they want their ceremony to be and … where they want to serve the cake. 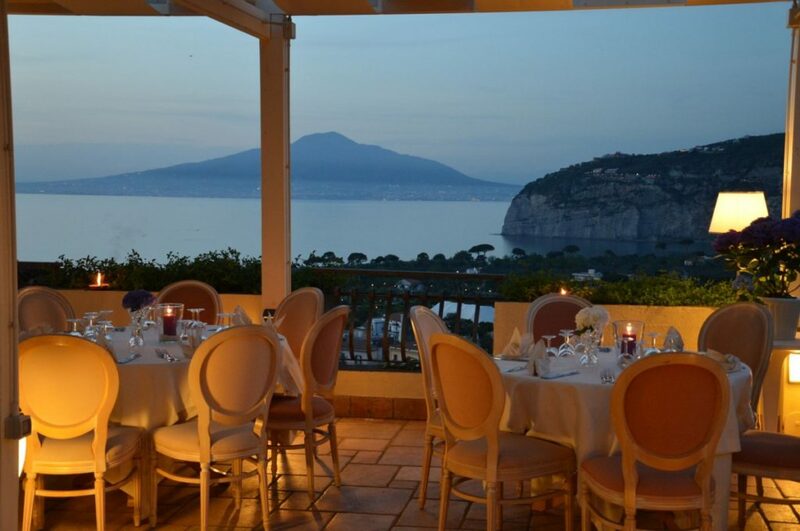 The menu is a cost between Euro 105 – 130 + 10% Vat per person with a minimum of 80 people. The menu is a set of 3 dishes and the choices could be discussed with the couple. Remember you can customize your wedding and make it YOUR dream day. For this reason, it is advised that you or your wedding planner contact the property in order to discuss further details. 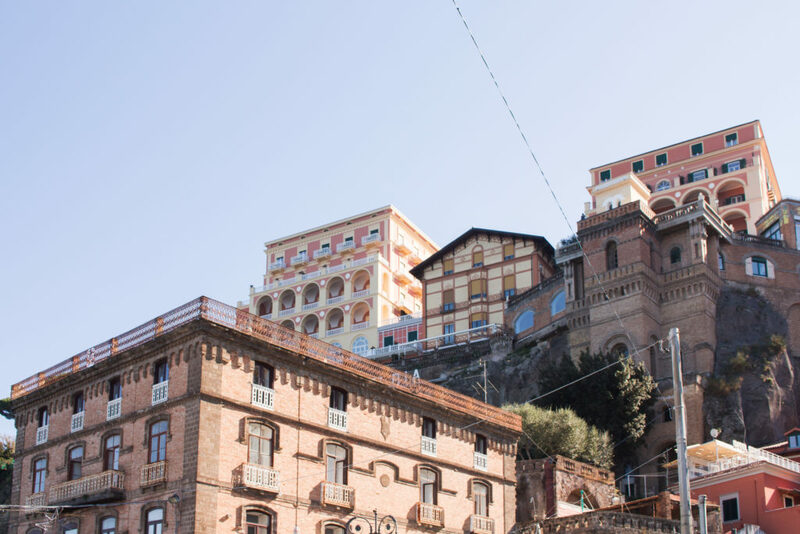 This gorgeous town facing the Bay of Naples is one of the most requested locations for destination weddings in Southern Italy, thanks to its impressive tuff cliffs and sunny seascapes. 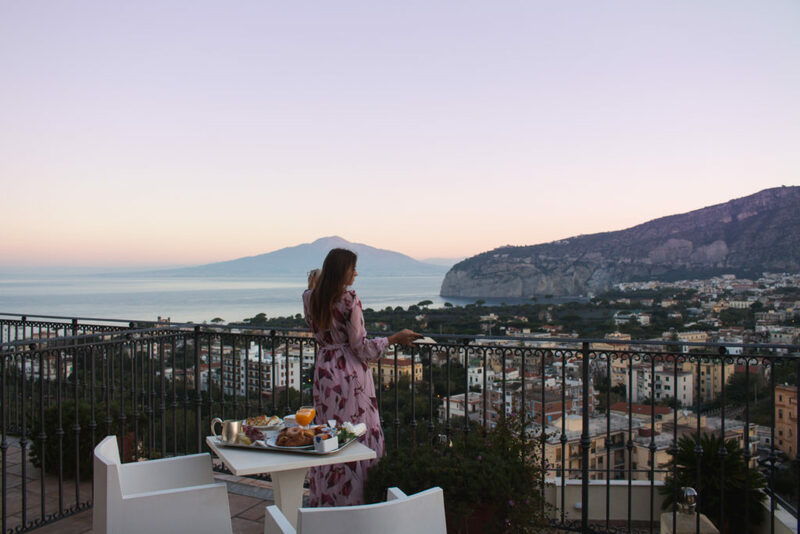 Sorrento welcomed us with the view of Mt Vesuvio and the city of Naples by the sunrise from the beautiful terrace of Hotel Cristina. 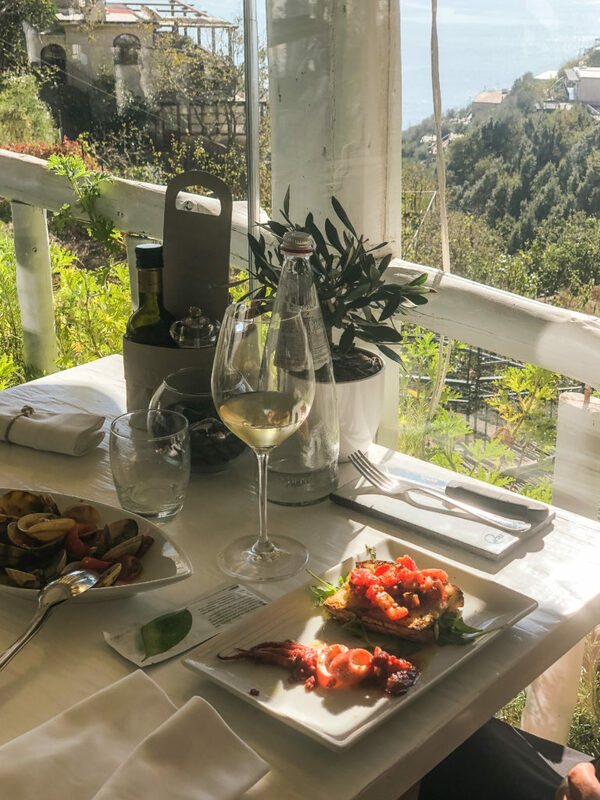 Believe me – this could make enough of a reason to stay at Hotel Cristina, which is located on the top of the hill. 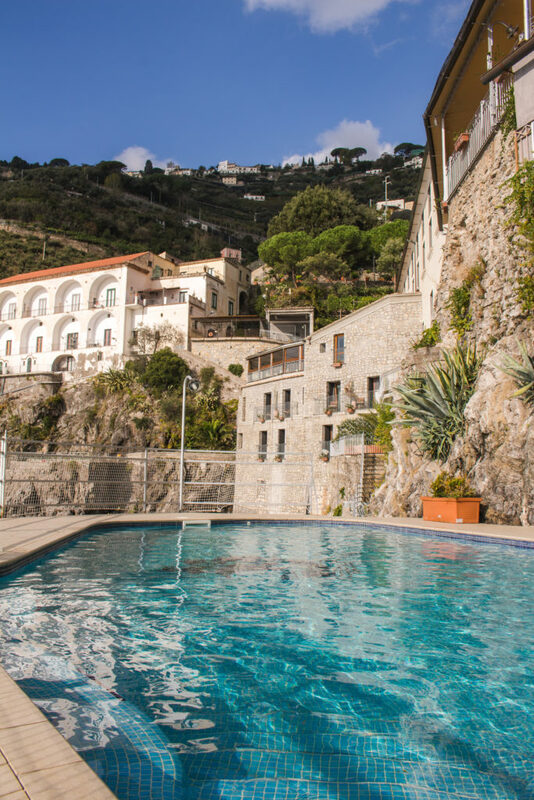 Hotel Cristina is a family owned property, which makes the place really welcoming. You can feel a great atmosphere the moment you enter the reception. I met a group of American tourists the other day and their lovely tour guide mentioned he loves coming back to Hotel Cristina mainly because of the people who run the place. I really think it is a very important factor when choosing your wedding venue. 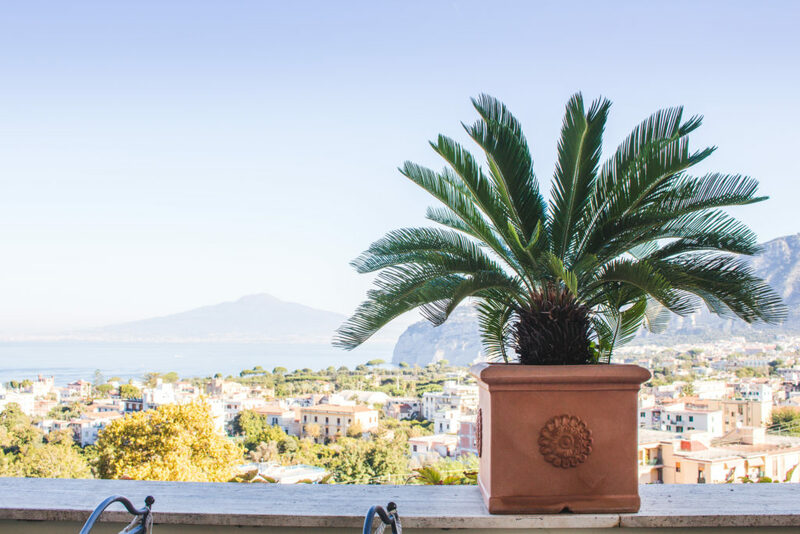 The owners are really passionate and proud about what they are doing and it is clearly visible all over their properties (they have a sister-property in Sorrento city centre). 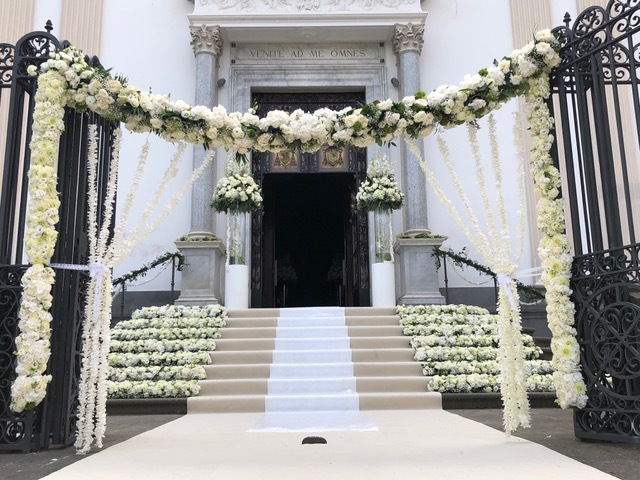 In fact, one of the owners had her wedding placed at the Hotel Cristina and it was the biggest wedding ever since the hotel was open. 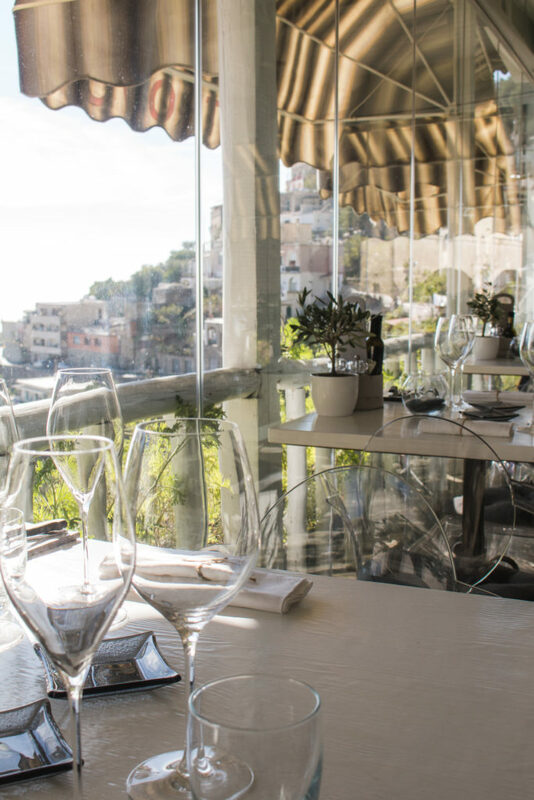 The breakfast, lunch and dinner are served on a rooftop terrace. 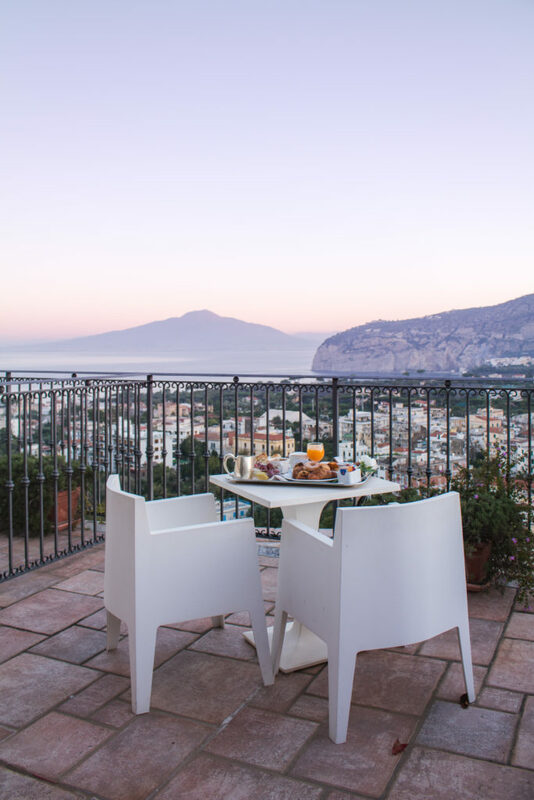 You can sip your morning coffee with one of the most covetable views in the world! 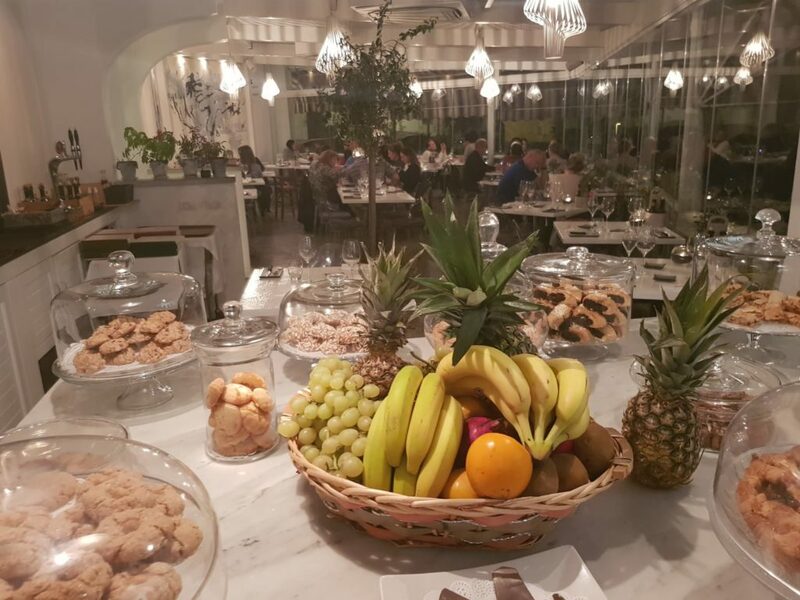 The food at the hotel is prepared with the passion, which you can tell from their rich menu. We were served a sample event menu as well as the iconic seafood dished available at the hotel anytime. 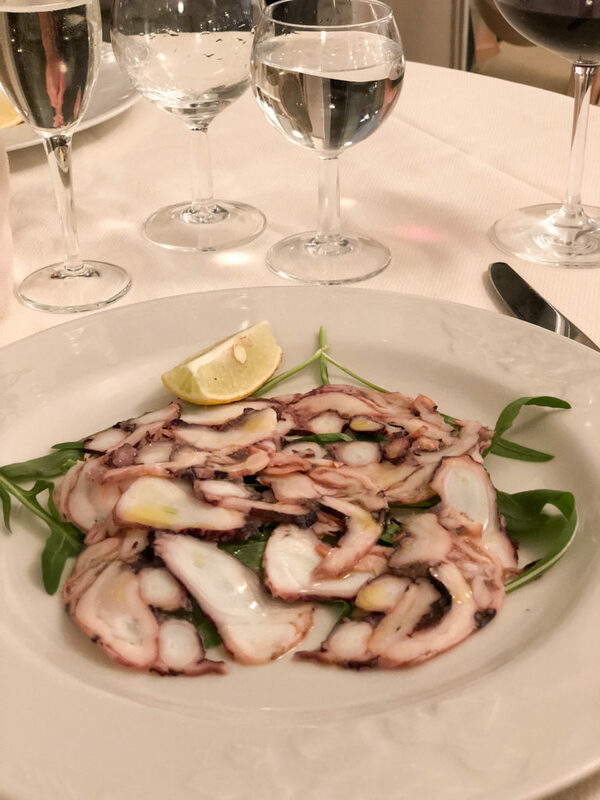 My favourite meal was an octopus carpaccio accompanied by delicious le lune del Vesuvio white wine. 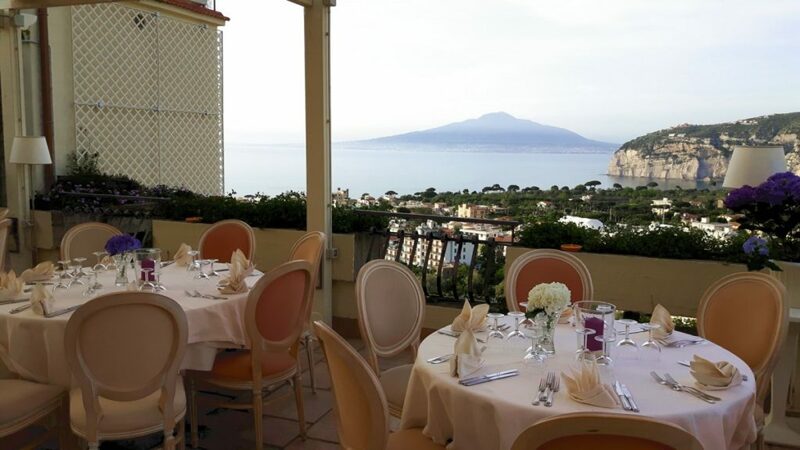 The weddings are held at the top floor restaurant with a terrace overlooking the wonderful Bay of Naples. 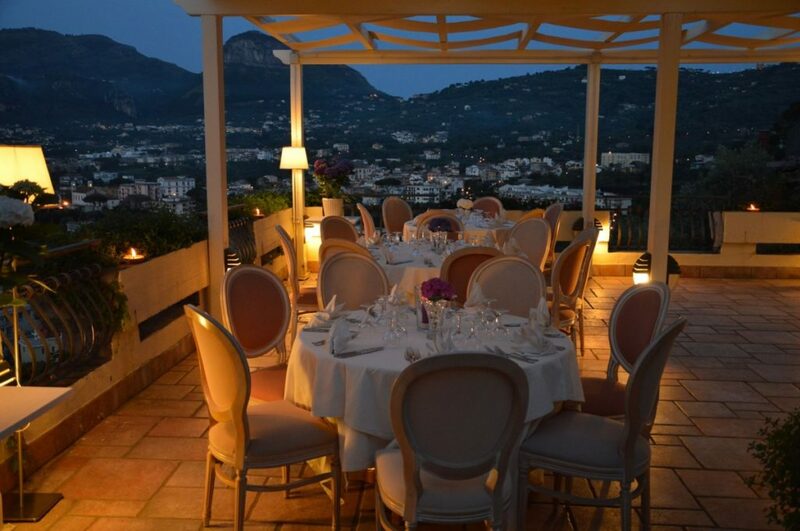 It is also possible to keep the top floor restaurant and terrace space with open bar service for the whole night waiting for the sunrise. Music duo will play music during the meal and dance music later, or any kind of music you wish! Drinks could be served for the whole time. 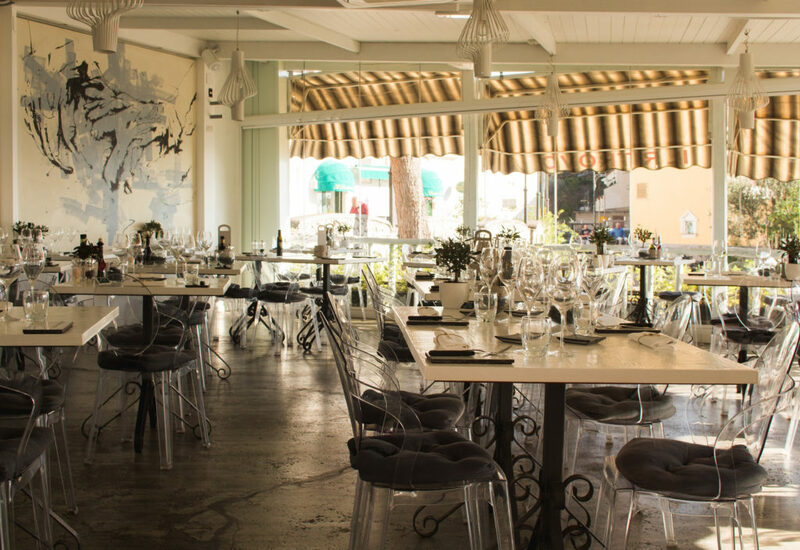 It is also possible to have exclusive use of one of the restaurants for the family and friends for the days prior or after the reception. Struggling with finding the right venue? As mentioned in my previous ‘Wedding Destinations’ articles, it is not a shame to struggle with the wedding ‘matter’. I always encourage my readers to seek a professional help – someone who lived in a place of your wedding. Someone who can help you with the organization, has a great taste, previous experience and… a lovely appearance! Ideally, I would be looking for people who would use your budget in the best possible way and avoid making you worried about every possible detail. 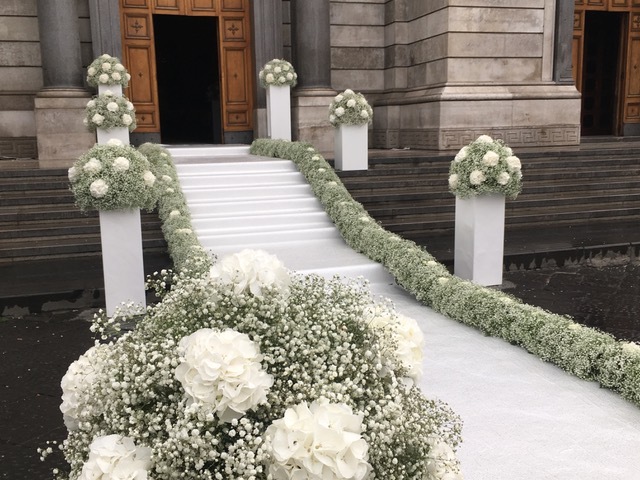 I met Fratelli Elefante, an event agency and florist that specializes in weddings. They could definitely help you make your dream day come true in many ways. As you could tell from their portfolio (click here) they have years of experience and are able to set a wedding everywhere the client wants. Their Instagram looks like a beautiful garden and all the opinions you can find about them are very positive. As for the prices and packages – they do have some basic packages, but most of the total cost is depending on a client and their needs. One thing the couple can be sure of is the efficiently and wisely spent budget. 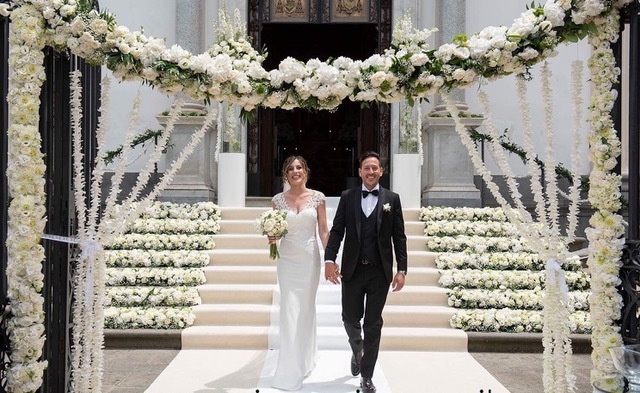 Church’s arrangement, location’s arrangements and bouquet: from €3000 to €7000. 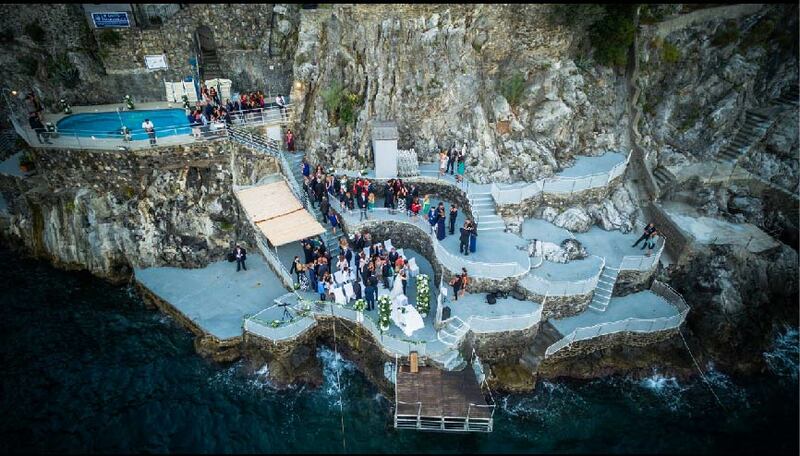 Why would you choose Amalfi Coast for your Big Day? 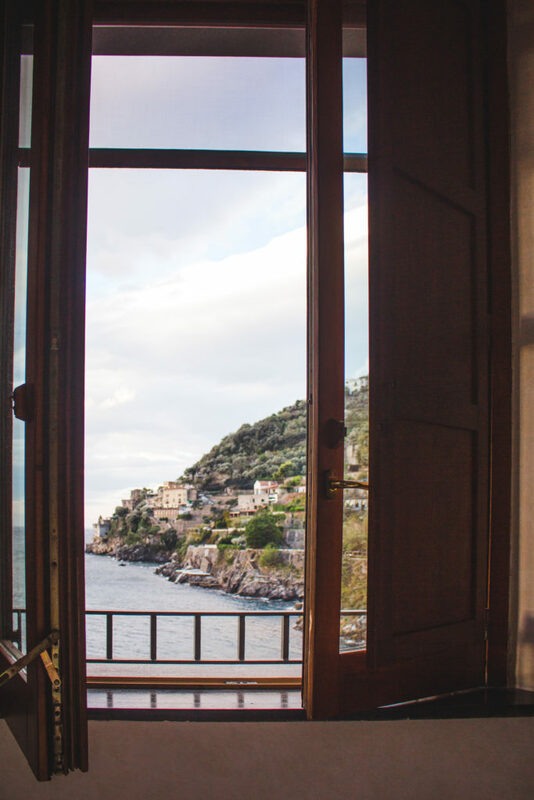 Well… first things first – the views! 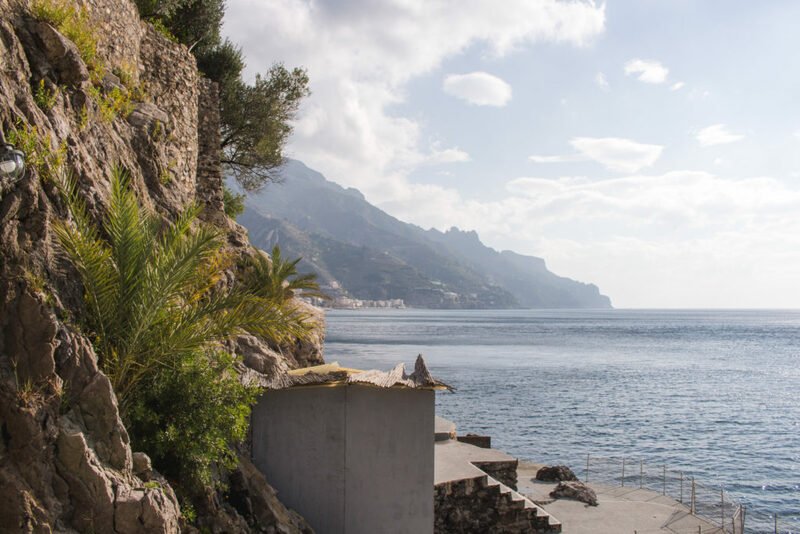 Amalfi Coast has been voted one of the most beautiful corners in the world for a reason! 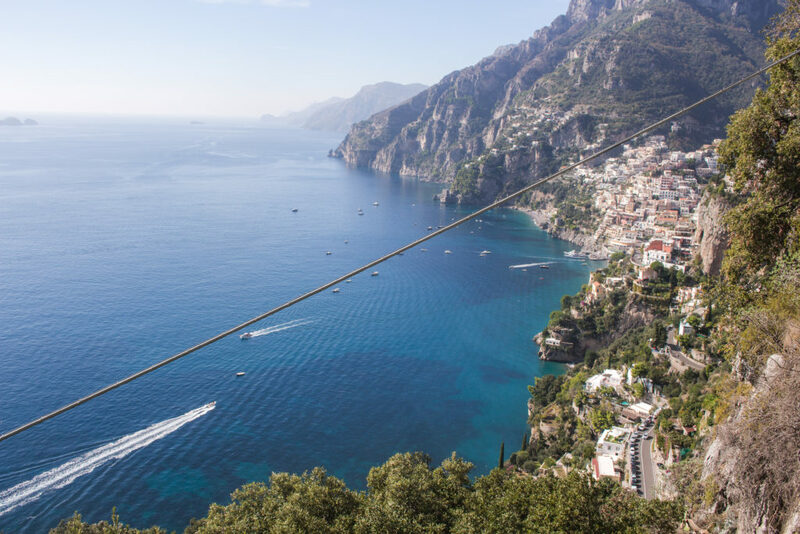 Whether you will travel by car, a scooter or by the public transport, the road along the Amalfi Coast is breathtaking. Make sure to put your phone away and enjoy every minute of your trip. People travelling by car and a scooter – I would stop every corner as the views are changing every kilometre. 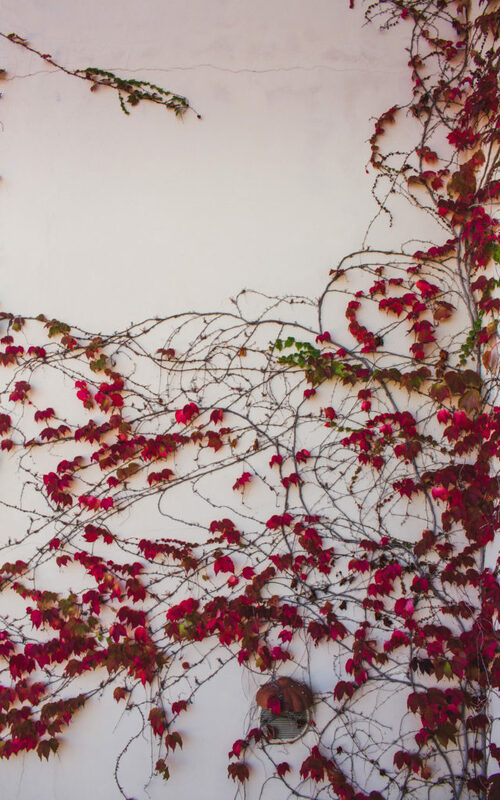 There are so many photogenic corners that make a perfect wedding photos background! 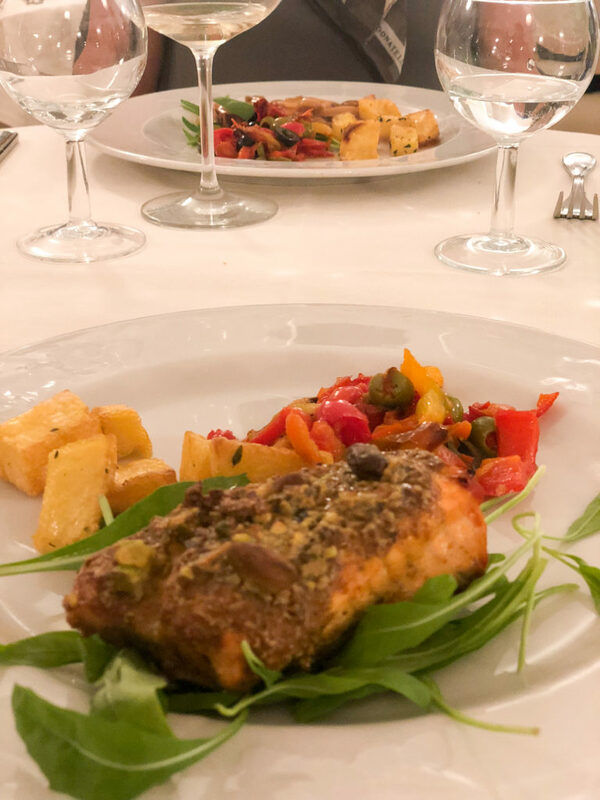 Italian food is my favourite food, which is why I would always say the cuisine could make enough of a reason to make your Big Day in Italy. 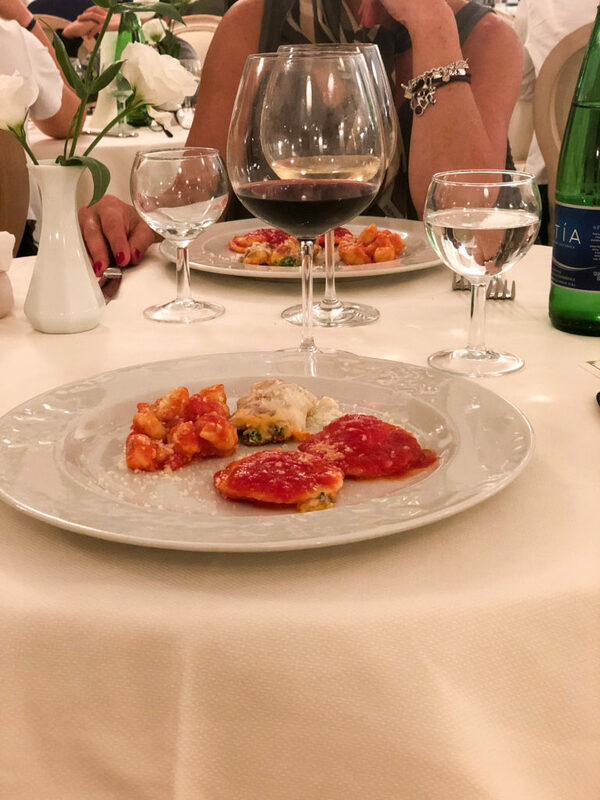 Italian food is so much more than just pasta and pizza, but what better place to have a slice of Margharitta than Amalfi coast! 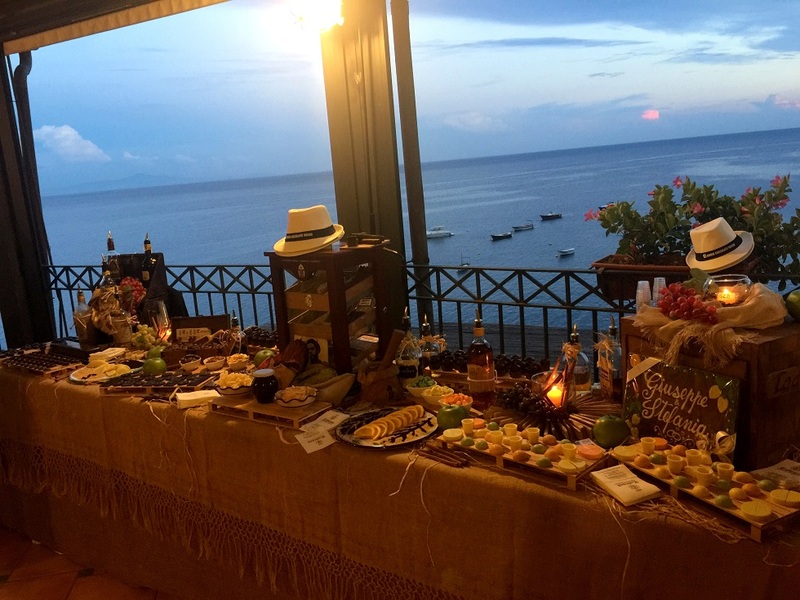 Amalfi Coast food means delicious shrimps, redfish, pezzogne, bream, sea urchins, octopus, blue fish, molluscs! 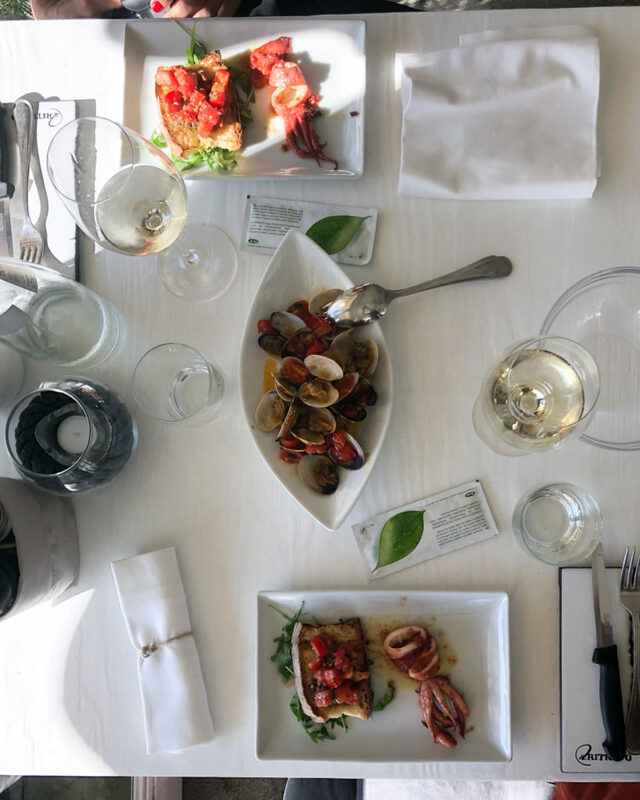 The seafood is exceptionally good at the Amalfi Coast, which you can also taste at Il Ritrovo. 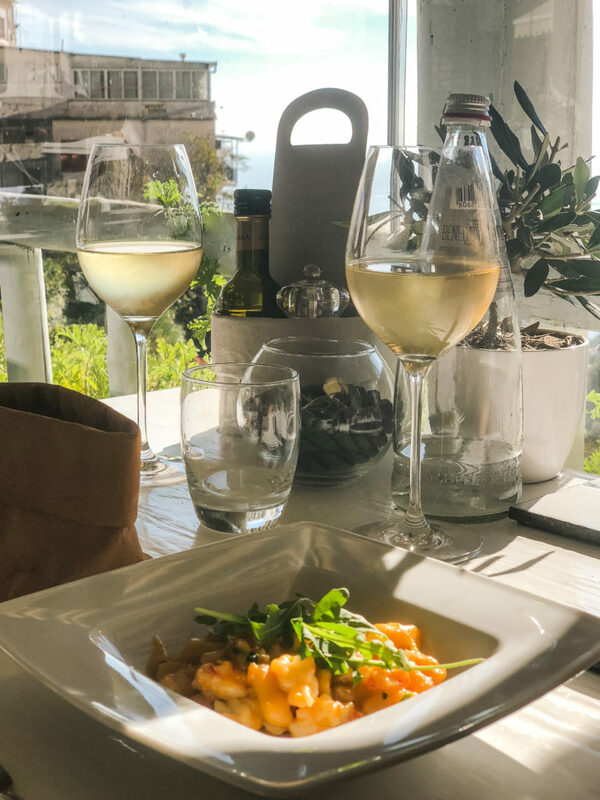 You should definitely try the “scialatielli ai frutti di mare”, a dish made with sea food and fresh pasta. 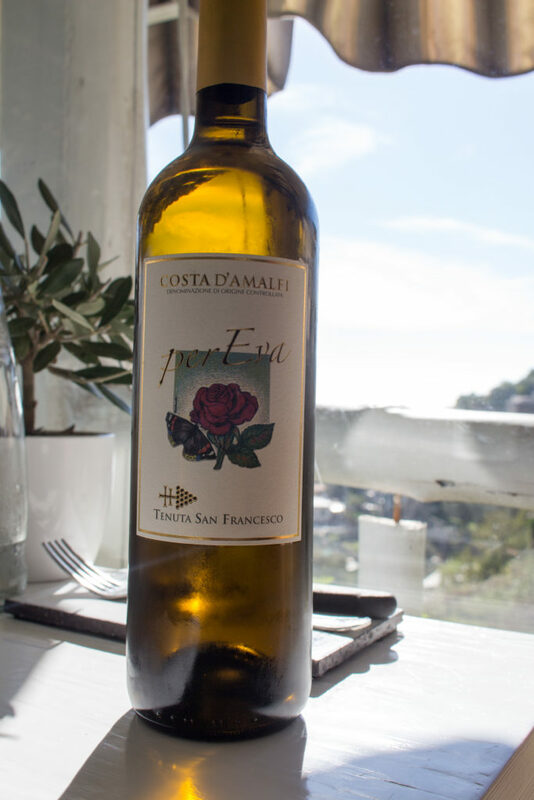 I also loooved Amalfi white wine called per Eva. 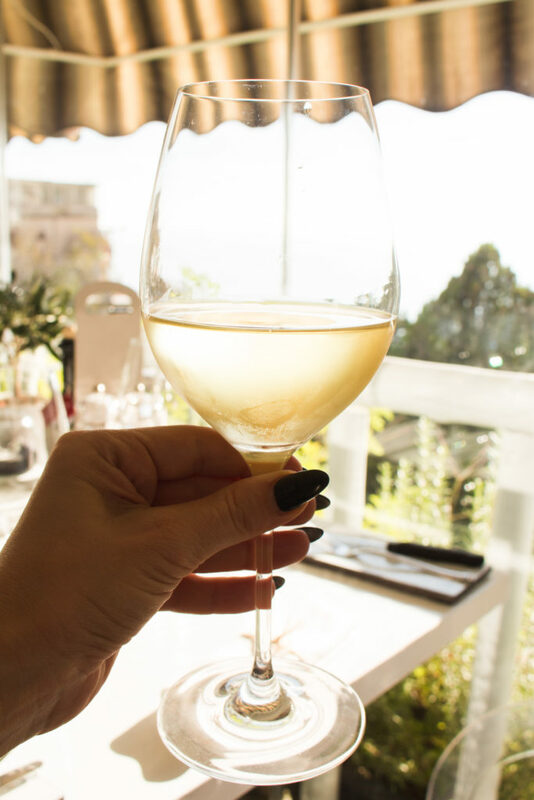 The Amalfi Coast is also known for its production of limoncello liqueur as the area is a popular cultivator of lemons, sfusato Amalfitano. The lemons are grown in terraced gardens along the entire coast between February and October. 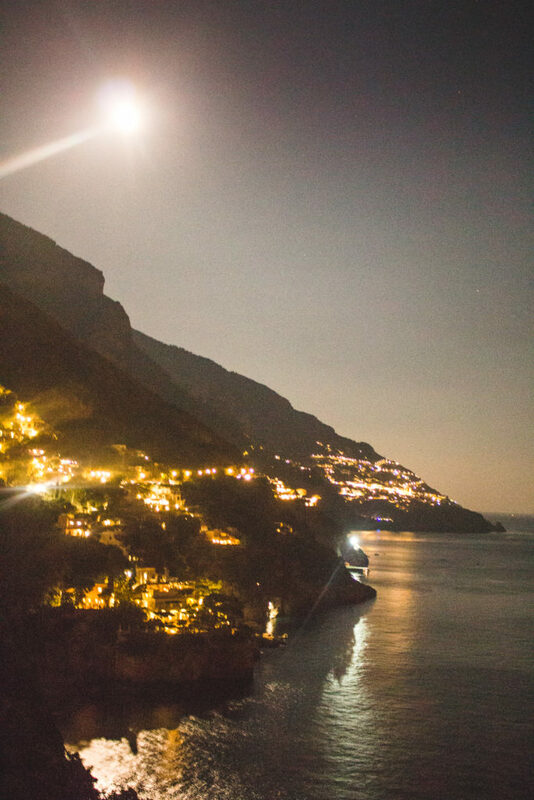 A little Positano is located in one of the most beautiful valleys of the Amalfi Coast, and the valley opens up to an equally magnificent stretch of coastline, which is a romantic and enchanting location for celebrating a wedding. 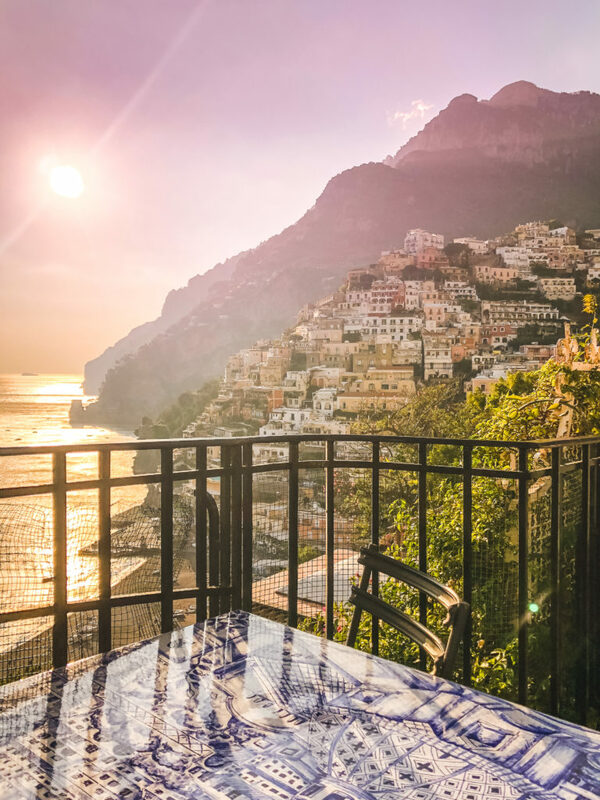 According to the local legend, Positano was founded by a group of inhabitants from Paestum who were escaping from the attack of the pirates. The first official information about the town’s existence comes from some ancient Roman era, but some artifacts from the Palaeolithic Era were also found in Positano. These artifacts clarify an ancient origin of the city. 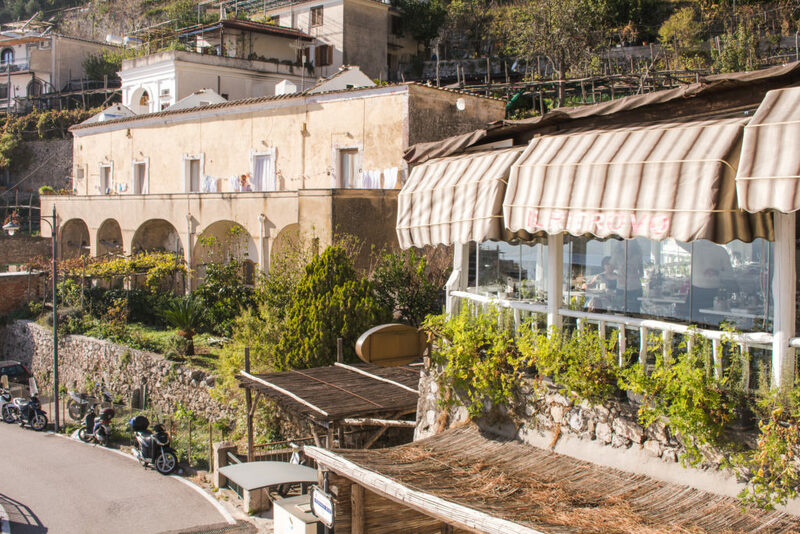 The town itself is perched on an enclave on the face of a hill and winds down towards the waters of the Amalfi Coast. 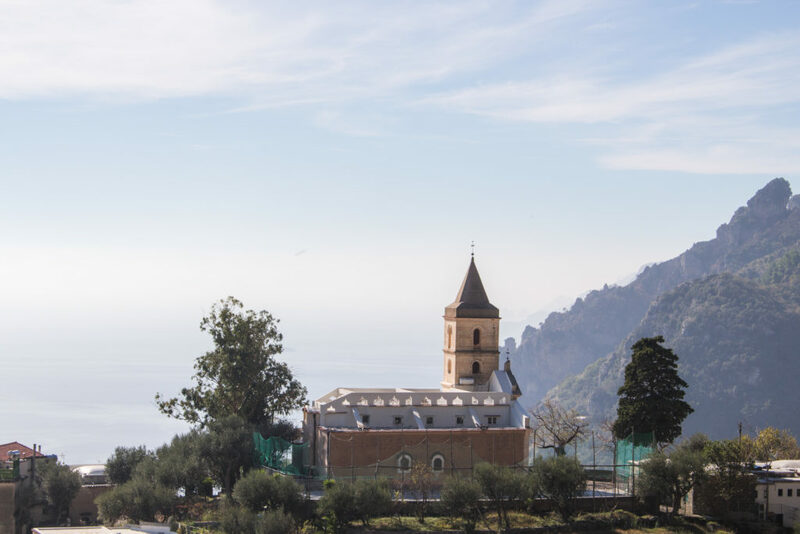 Santa Maria Assunta, the main church of Positano is also the main building. 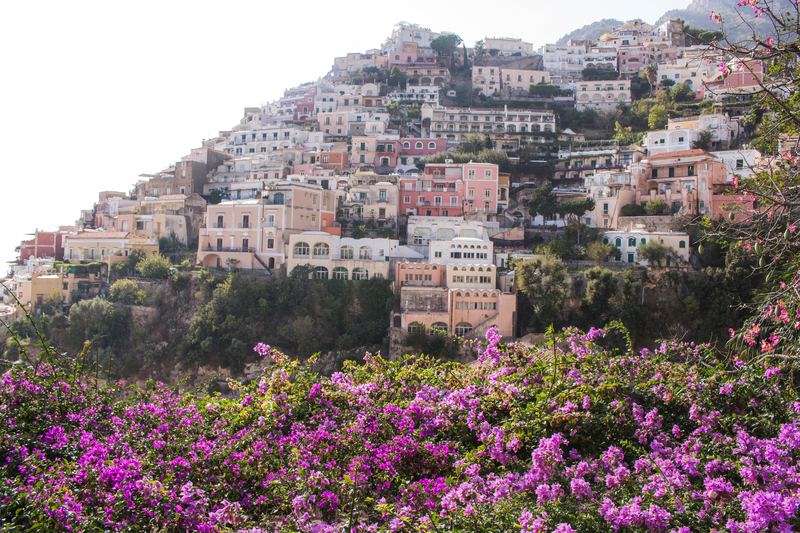 You can see the chapel on the majority of Positano features. 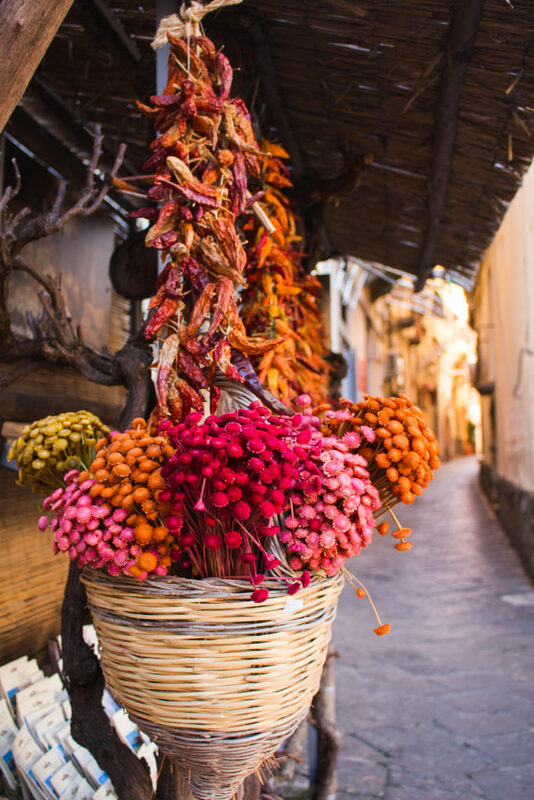 Positano has a very glamorous side to it, because of the famous ‘Positano fashion style’, this is just one of the many reasons that tourists from all over the world flock to the pathways and boutiques of Positano each summer. The city is also known for its famous ceramics and artwork. 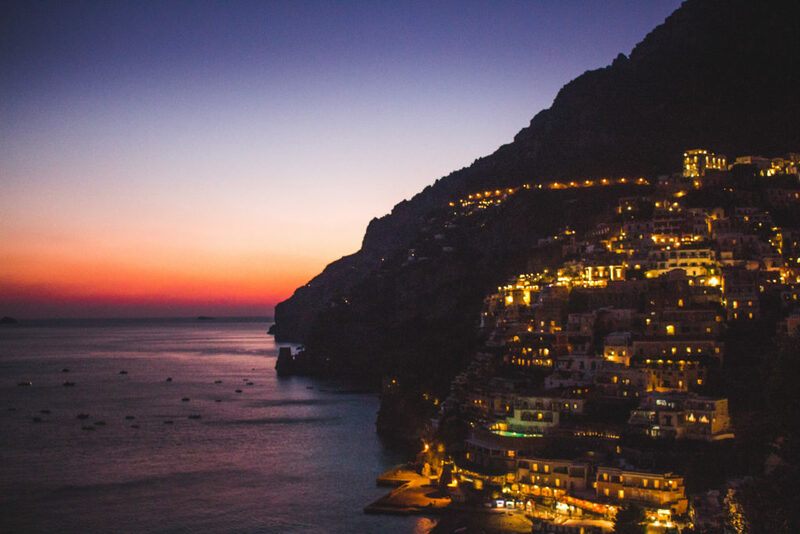 The sunsets in Positano are a must-see! The city is known for being a perfect sunset photo spot and it truly brings photographers from all around the world. 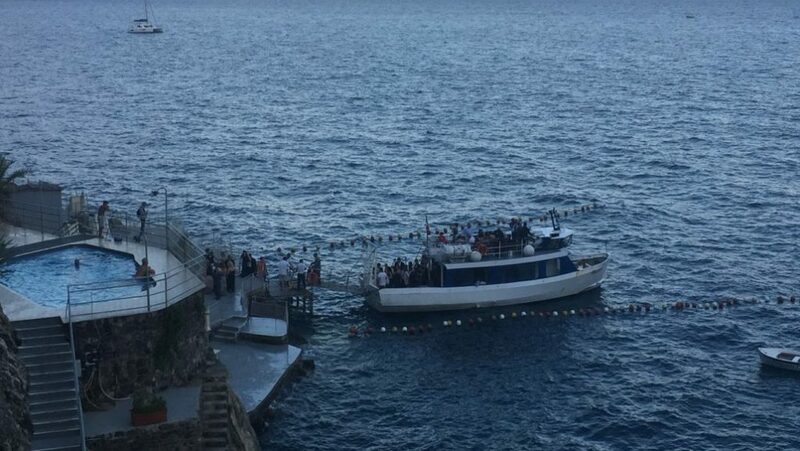 There are several boat companies offering a sunset cruise, which is undoubtedly a great experience (perhaps even for an ‘I do’ moment?). Unfortunately, the end of October tends to be a bit windy – for this reason, the majority boats weren’t sailing (despite a very good weather!). If you are really keen sunset watcher, I would suggest choosing September or the end of May. 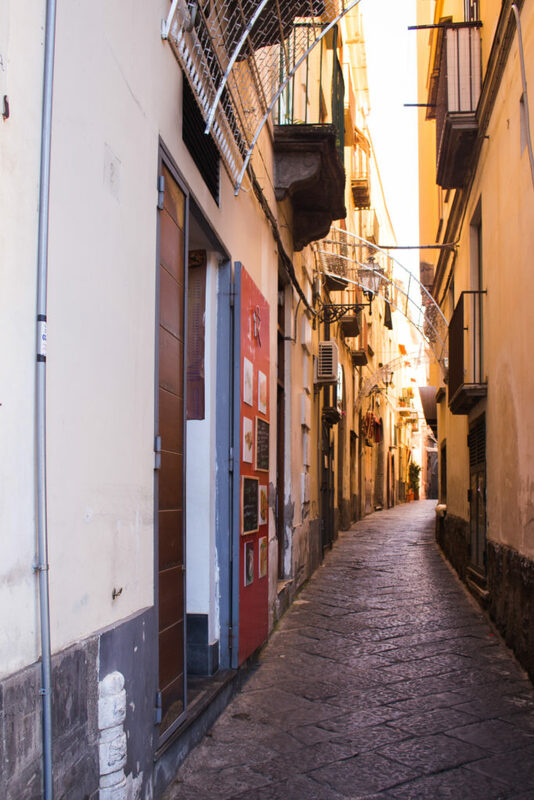 Sorrento and its romantic alleyways! 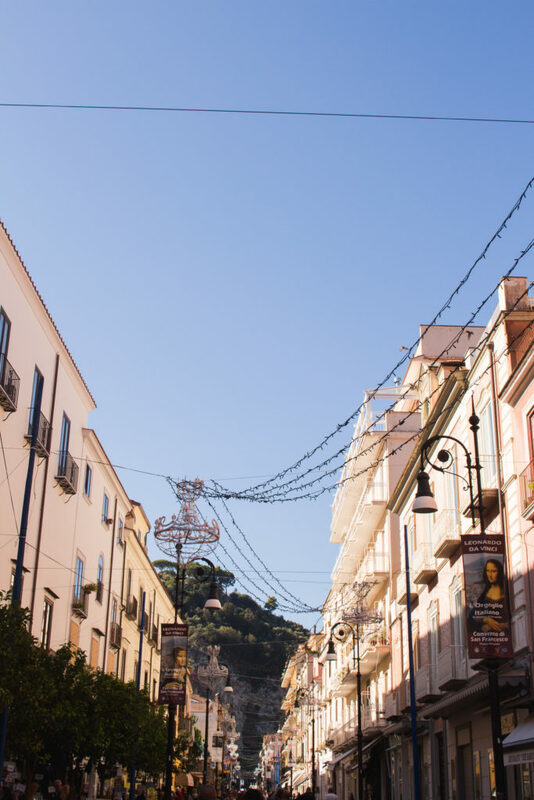 The history of Sorrento is actually much older than the stories of Capri and Positano. The city was discovered by Phoenicians. They were followed by the Greeks, the Romans and the Normans. When Sorrento was annexed to the new Kingdom of Italy in 1861, it increased its status of one of the most renowned tourist resorts in Italy, and it’s easy to understand why: Sorrento has all the most appealing aspects of Italy: stunning natural beauty, history, romantic alleyways, delicious food and wine, shopping (iconic Italian fashion houses!) and the Italian hospitality. 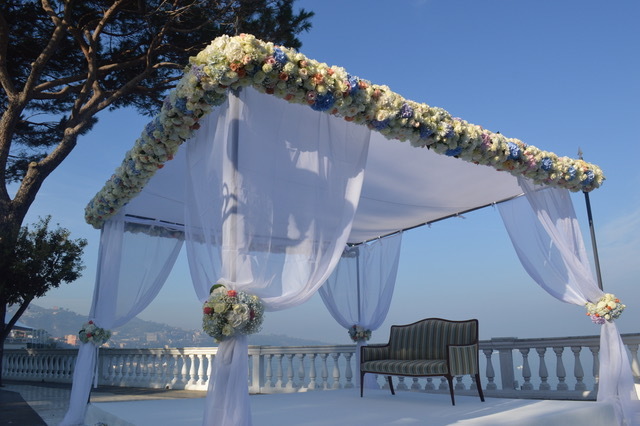 In 2018, is becoming a very popular wedding destination – not only for the couples from a nearby Napoli. 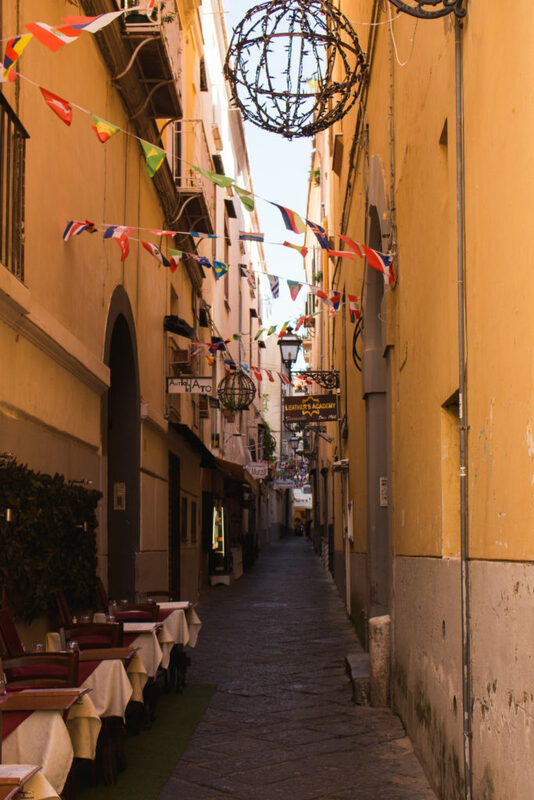 The city is loved and visited by many Italian families and has been on a map of many great inventors and personalities, such as Lord Byron, Keats, Goethe and Walter Scott. 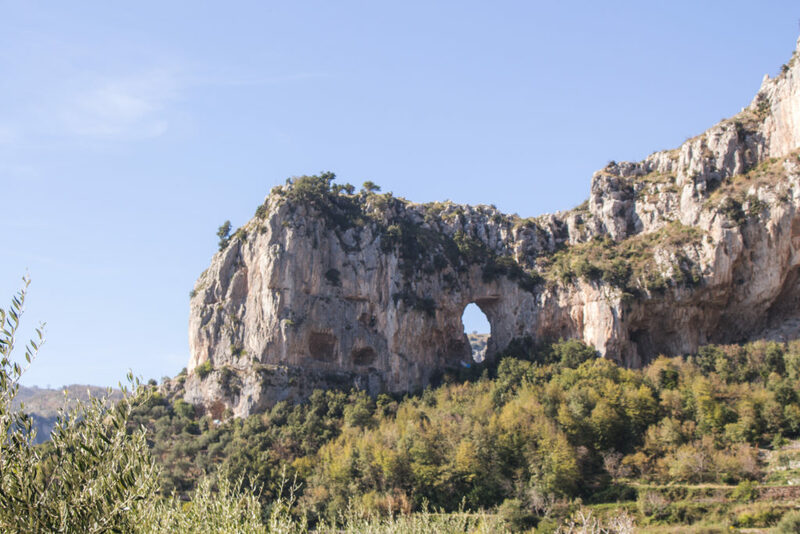 Whether you are getting married or not, I really encourage to visit this part of Italy and I recommend to do it in October. 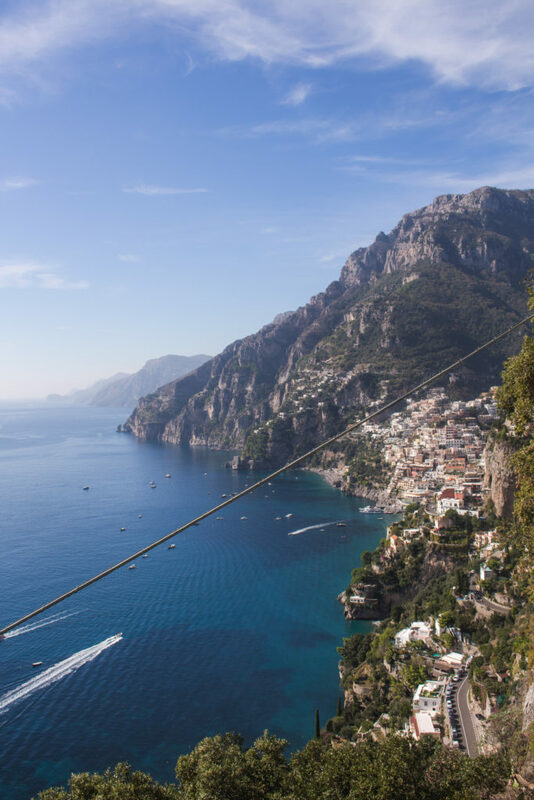 It obviously depends what you are after, but sightseeing in a 23ish temperature was very pleasing, while I still managed to jump into the water in Positano beach! The prices were much lower and there was less crowds (in compare to Santorini in September and Positano is equally busy). 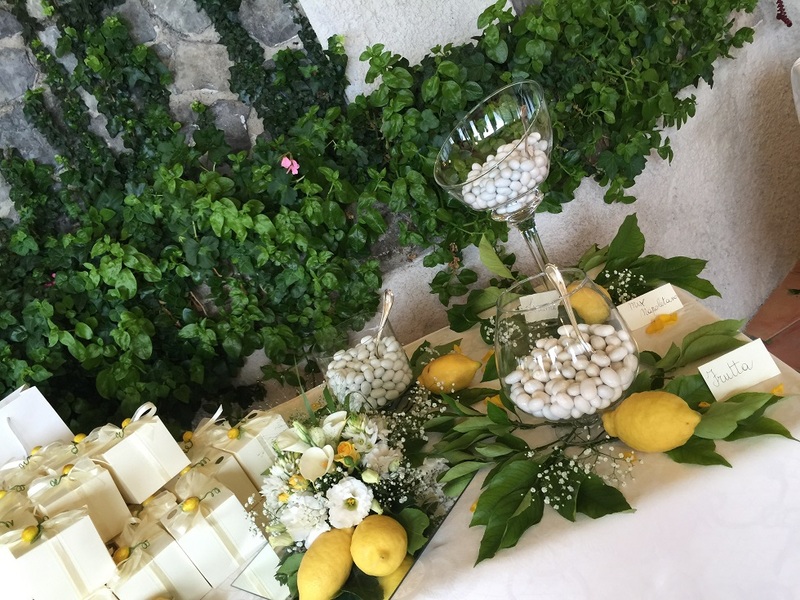 I also encourage you to check on my Wedding Destination article from Tuscany. The photos are spectacular dear. What a gorgeous view!